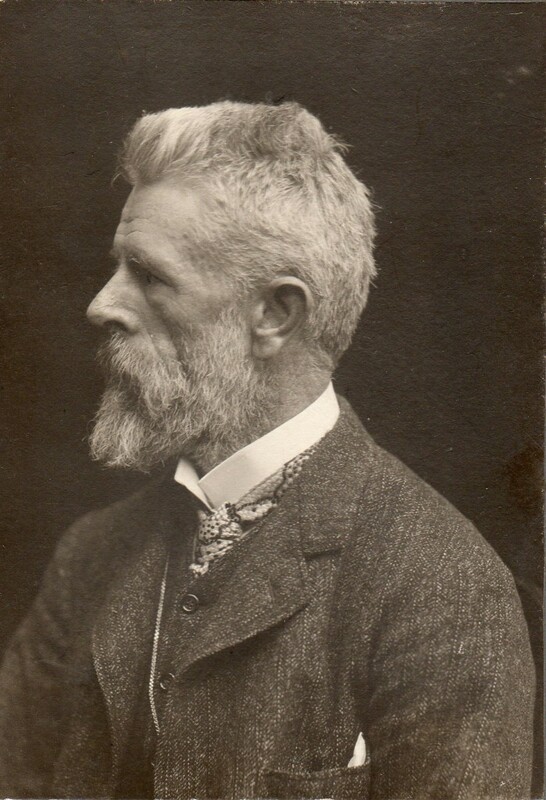 Laurits Tuxens (1853-1927) private foto album 1902 – 27 – dagligdag med kunstnerisk arbejde, fest, jagt og afslapning i Skagen, Danmark. 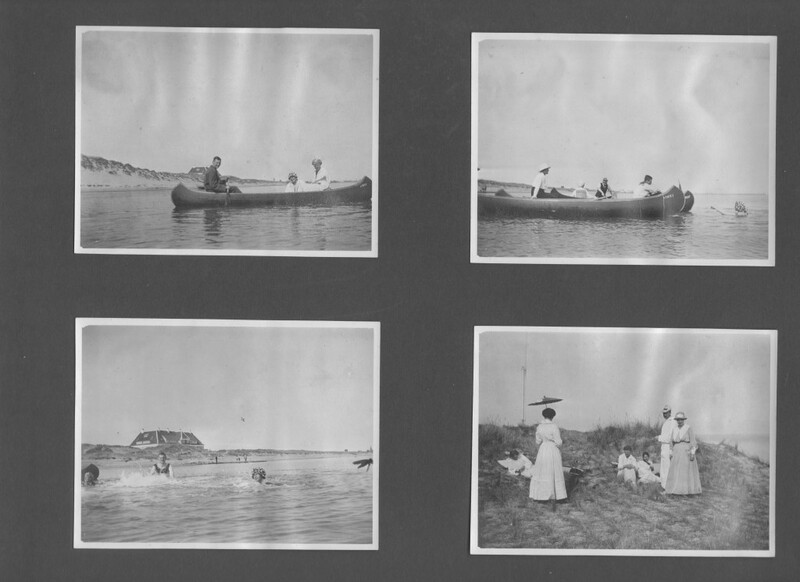 Photos by Laurits Tuxen et al. Danish painter and sculptor Laurits Tuxen visited Skagen for the first time only 16 years old in summer 1870. He was educated on Royal Danish Academy of Fine Arts in Copenhagen 1868-72. Click on photo and use your zoom control and you see them in full screen size and text on right side on photo disappear. 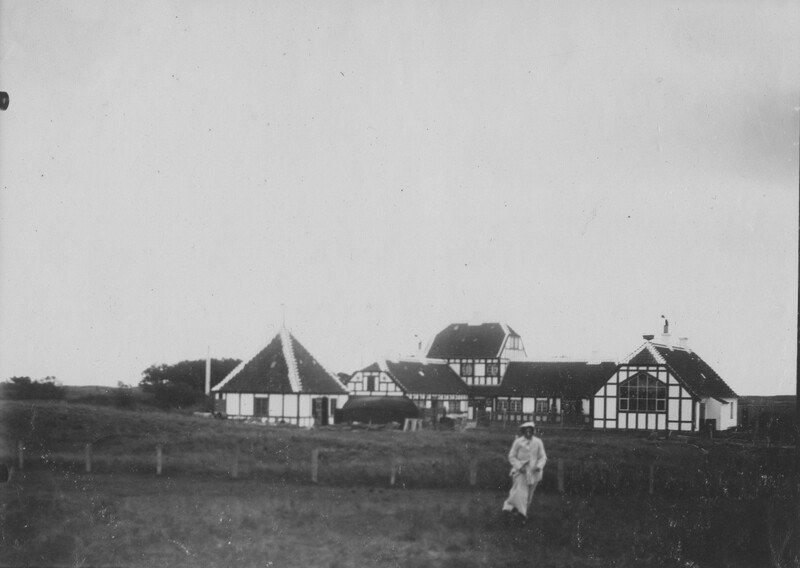 “Villa Dagminne”, Skagen 1902. Rebuilding and enlargement of former “Madam Bendsen Yard” (Madam Bendsens Gård) with the new atelier (new building on right side of photo) and summerhouse of Laurits and his second wife Frederikke Tuxen (1856-1846). Rebuilded by royal building architect Thorvald Jørgensen (1867-1946). Photo 1902. Photo scanned 2. february 2016 from Laurits Tuxens private photo album 1902-27. Laurits Tuxen stayed in Paris 1875-76 together with swedish and norwegian artists to learn and study the new french painting expression. Laurits Tuxen took lessons on Léon Bonnat´s (1833-1922) painting school in Paris from december 1875 until april 1876. In summer 1877 Laurits Tuxen returned to Paris and studied the new french painting in motif, composition and technique on Léon Bonnats painting school winter 1877-78 together with his friend danish painter P. S. Krøyer. Summer 1878 the two friends painted together in Saint Malo, Bretagne, France. Click on photos and use your zoom control and you see them in full screen size. 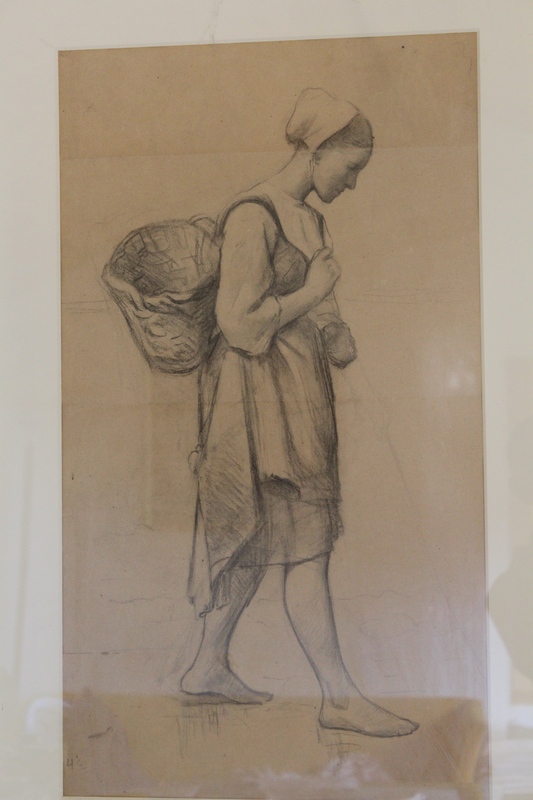 Drawing 75 x 43 cm by Laurits Tuxen. 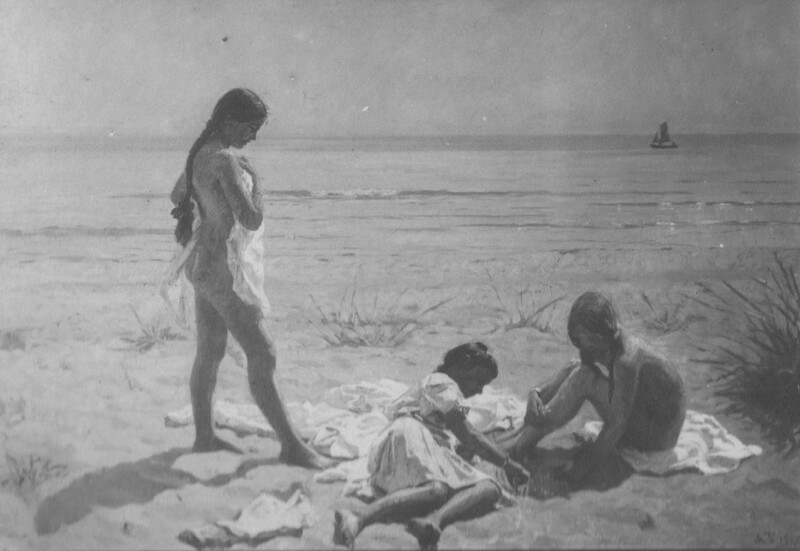 Drawing 75 x 43 cm by Laurits Tuxen to final painting: “En fiskers datter på stranden”, Bretagne 1880, Olie på læred, 75 x 43 cm. Private. Copyright Erik K Abrahamsen 2016. All rights reserved. Photo by Erik K Abrahamsen 25. september 2016. 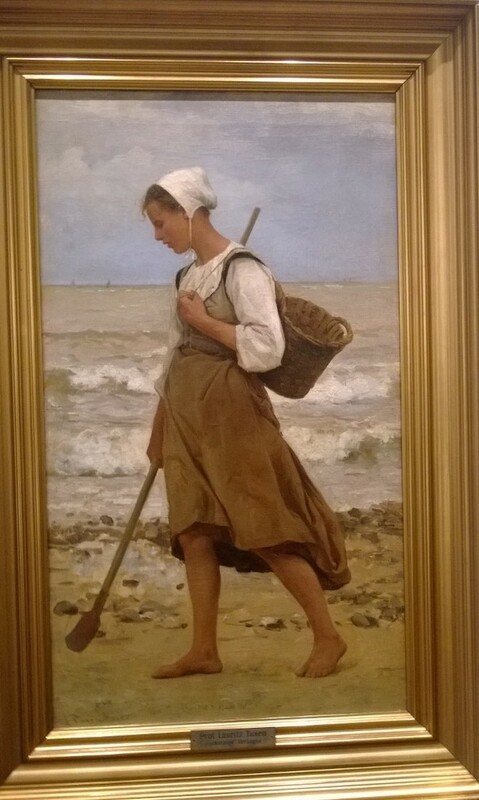 Laurits Tuxen: En fiskers datter på stranden. Bretagne, 1880. Olie på lærred 75 x 43 cm. Foto 2014. Engagement photo – Forlovelsesfoto, Copenhagen, Denmark 1885. 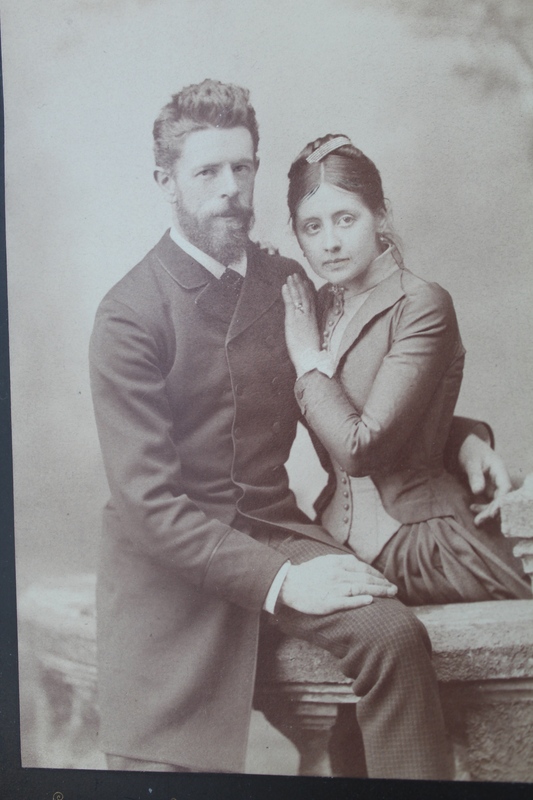 Hansen & Weller: Engagement photo of Laurits Tuxen and Ursule de Baisieux, Copenhagen 1885. Forlovelsesfoto. Photo by Erik K Abrahamsen of original photo 6. may 2016. Original photo. Private. The 6. march 1886 32 years old Laurits Tuxen married 23 years belgian Ursule de Baisieux born 5. december 1862 and they settled in Paris. Laurits Tuxen: ” Ursule i brudedragt, Paris, 1886″. Olie på lærred. 55 x 32,5 cm. Privateje. Laurits Regner Tuxen : “Ursule in wedding dress, Paris, 1886”. Oil on canvas. 55 x 32,5 cm. Private. Charlotte Pauline Ursule de Baisieux on her wedding day, Paris 6. march 1886. Ursule de Baisieux was born 5. december 1862 in Bruxelles, Belgium. Photo 6. may 2016 by Erik K Abrahamsen. Laurits Tuxen: “Ursule in wedding dress”, Paris, 1886. Oil on canvas. 55 x 32,5 cm. Private. Photo may 2016 by Erik K Abrahamsen. Brev 58 Fredag d. 26. februar 1886. Brev oversat fra fransk fra Ursule (Dulette) de Baisieux til sin forlovede Laurits Tuxen en uge før deres borgelige bryllup i Bruxelles. Senere på året i 1886 blev Ursule og Laurits Tuxen viet protestantisk i en kirke i København. Letter 58 Friday the 26 february 1886 from Ursule de Baisieux to Laurits Tuxen. Brev 58 Fredag d. 26 februar 1886 fra Ursule to Laurits. Translation from french to danish by Marianne Abrahamsen. Copyright Marianne Abrahamsen 2016. All rights reserved. Scanned february 2016. 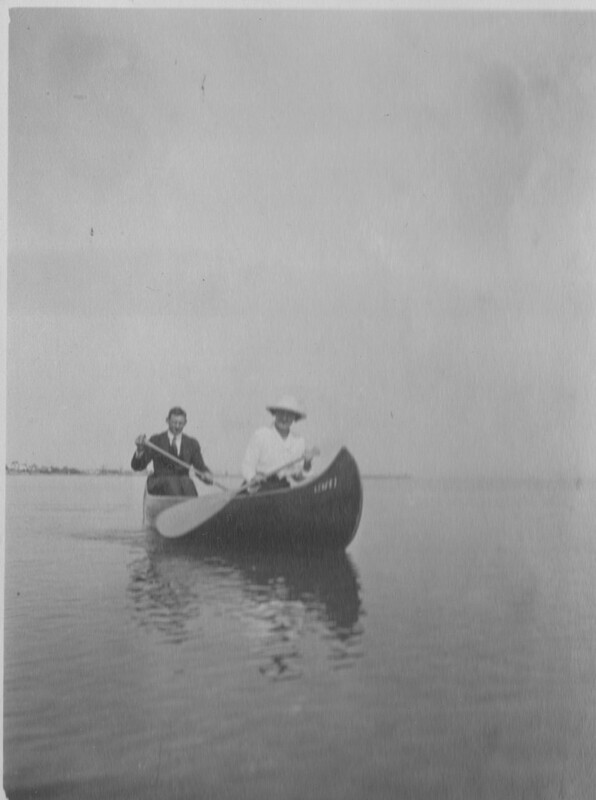 In april 1886 Laurits and Ursule Tuxen travelled to Capri, Italy on their honeymoon trip. “Portrait of Ursule as an Italian dancer”. Signed and dated L. Tuxen April 1886. Oil on canvas. 57 x 37 cm. 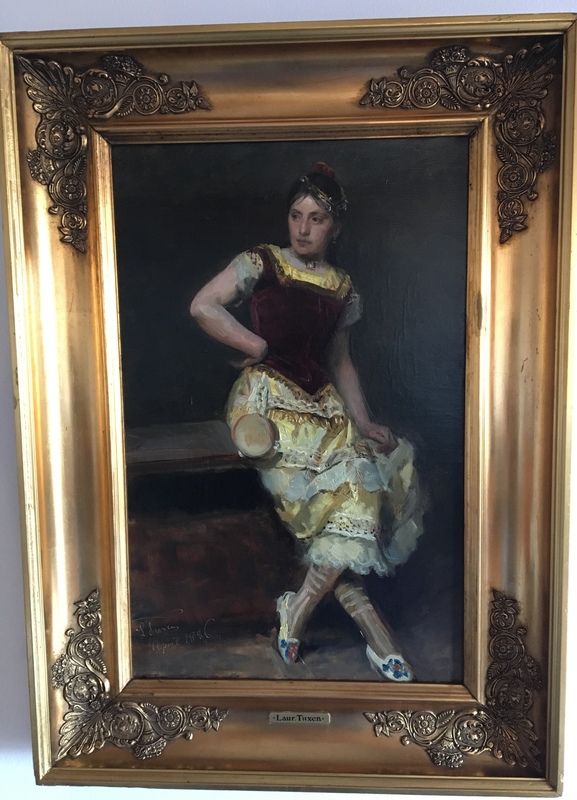 Laurits Tuxen, “Portrait of Ursule as an italien dancer”, 57 x 37 cm, oil on canvas. Signed and dated L Tuxen, April 1886. Private. Photo august 2018. Their first child Paula was born the 11. june 1887 in Paris. 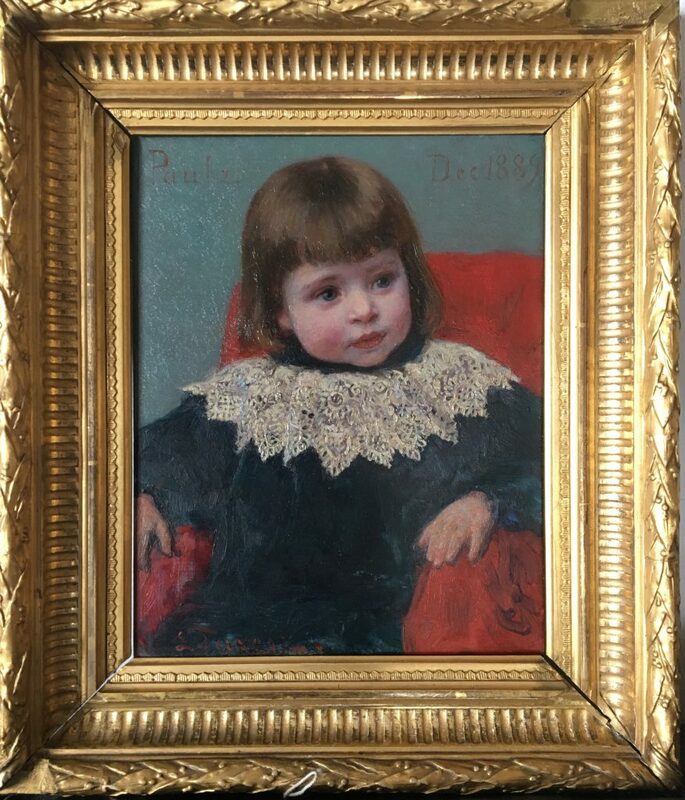 Laurits Tuxen: Portrait of Paula, oil on wood. Sign Paula Dec 1889 L Tuxen. Private. Photo august 2018. In 1888 Ursule and Laurits moved their permanent residence from Paris to Bruxelles, Belgium where Ursule´s father Charles de Baisieux and her mother Olympe van Calster lived. 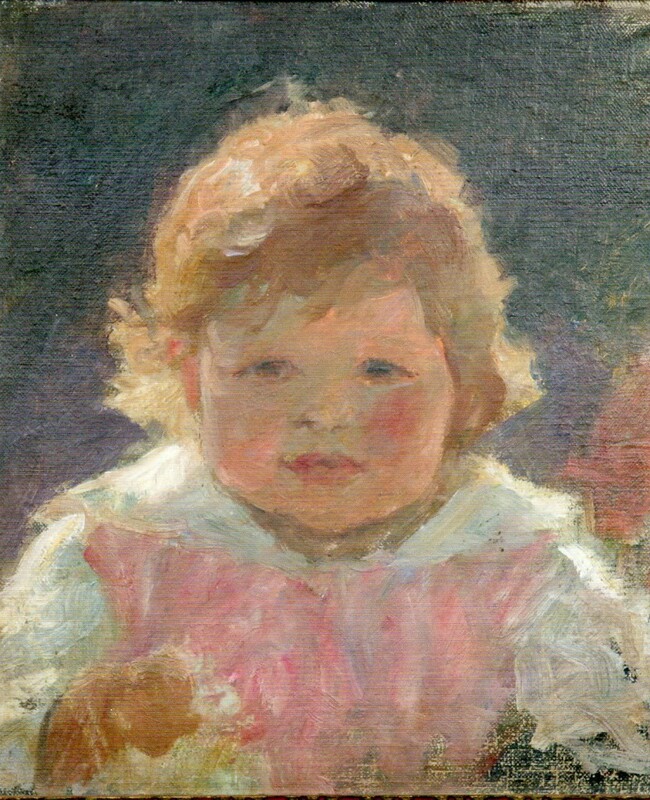 Their second child Elsa (Sasa) is born the 20. september 1892 in Bruxelles. 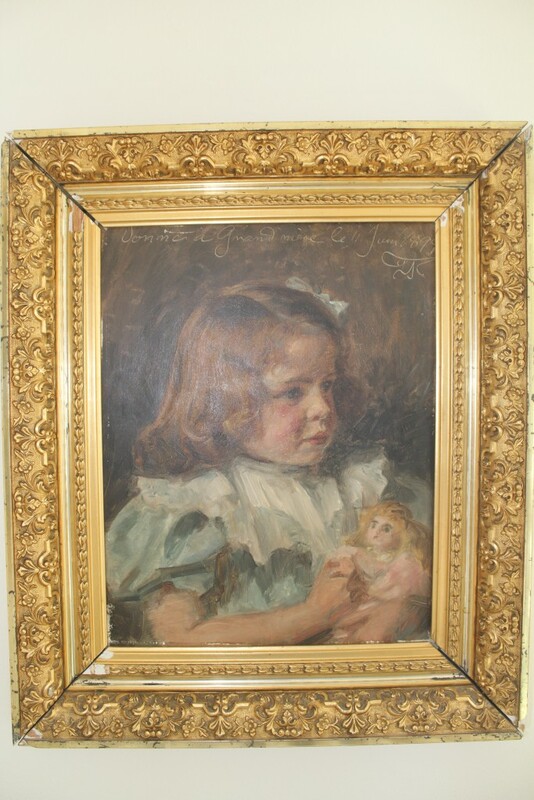 Painting by her husbond Laurits Tuxen. Coal and coloured chalk on cardboard. 1894, 40 cm x 32 cm. Private. Photo: 2008. Copyright Erik K Abrahamsen 2011. All rights reserved. Ursule Tuxen with her daughter Yvonne. Painting by her husbond Laurits Tuxen. Coal and coloured chalk on cardboard. 1894, 40 cm x 32 cm. Private. Photo: 2008. Copyright Erik K Abrahamsen 2011. All rights reserved. Laurits Tuxen: Yvonne 5 years, 1899. Oil on canvas. 40 x 31 cm. Private. Text on painting: “Vonne á Grand mére le 11. Juin 1899”. Sign L.T. Photo may 2016 by Erik K Abrahamsen. 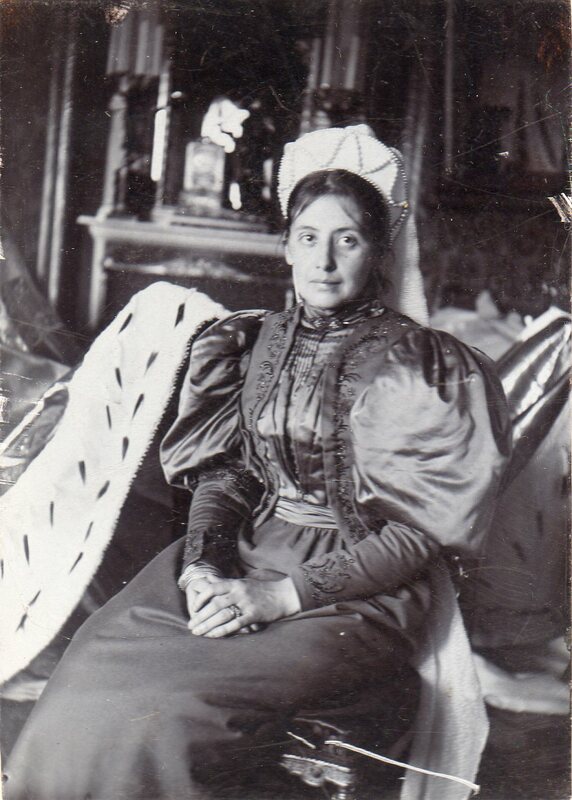 Their fourth child Nina is born 16. january 1898 in Copenhagen, Denmark. Laurits Tuxen and his wife Ursule and their 4 children lived in Rebecq, Belgium since 1889. Laurits traveled to paint in London (1887-99), Copenhagen (1886-99), Sct. Petersborg (1894) and Moscow (1896). 1891-92 Laurits and Ursule Tuxen traveled together to Palestine, where Laurits Tuxen painted. In april 1897 Laurits and Ursule Tuxen traveled together on vacation to Capri, Italy for recreation and painting. Oil on canvas, 142,5 x 180 cm., painted by Laurits Tuxen 1896-99. 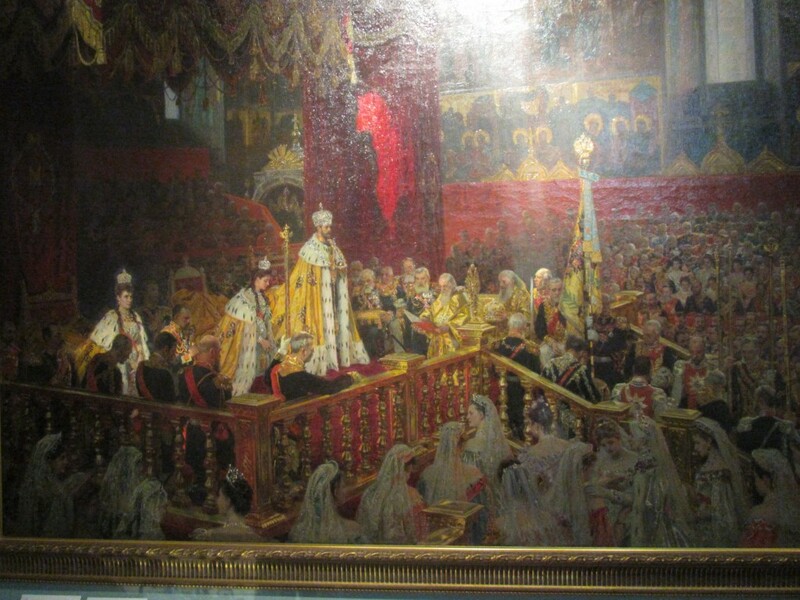 Czar Nicholas 2 Coronation 26. may 1896 in Uspensky Cathedral, Cremlin, Moscow. Oil on canvas, 142,5 x 180 cm., painted by Laurits Tuxen 1896-99. Photo extract. State Museum of Pavlovsk, St. Petersborg, Russia. Exhibition “Denmark and the czars of Russia 1600-1900” in Frederikborg Castle National History Museum, Denmark 29. august – 1. december 2013. Foto by Erik K Abrahamsen 26. november 2013. Copyright 2013 Erik K Abrahamsen. All rights reserved. In april 1897 Ursule and Laurits Tuxen travelled to Capri in Italy for a recreation holiday to strengthen Ursule´s health. 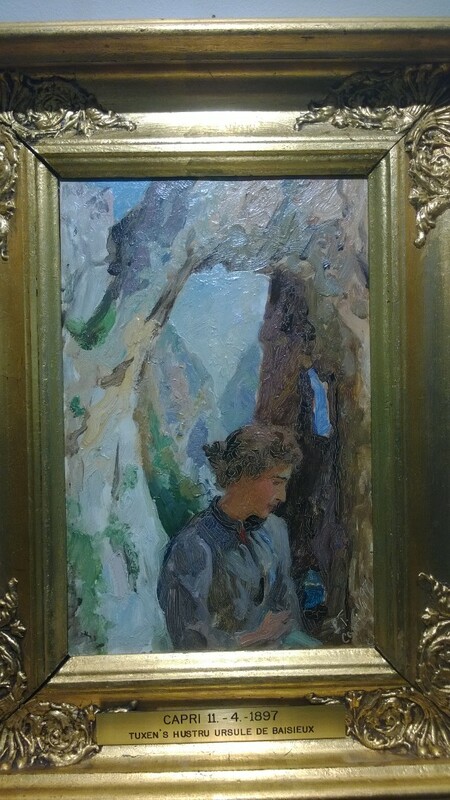 Laurits Tuxen: “Capri 11.-4–1897 Tuxen´s hustru Ursule de Baisieux”. Oil on panel. 23 x 15 cm. Source: Catalogue Fine Art + Antiques, International auction 854, Auction 24 February – 5 Marts 2015, Bruun Rasmussen, Auctioneers of Fine Arts, Copenhagen, Denmark. Photo taken on Bruun Rasmussens Kunstauktioner, Bredgade 33, København the 23. februar 2015 by Erik K Abrahamsen. Copyright Erik K Abrahamsen 2015. All rights reserved. The 6. 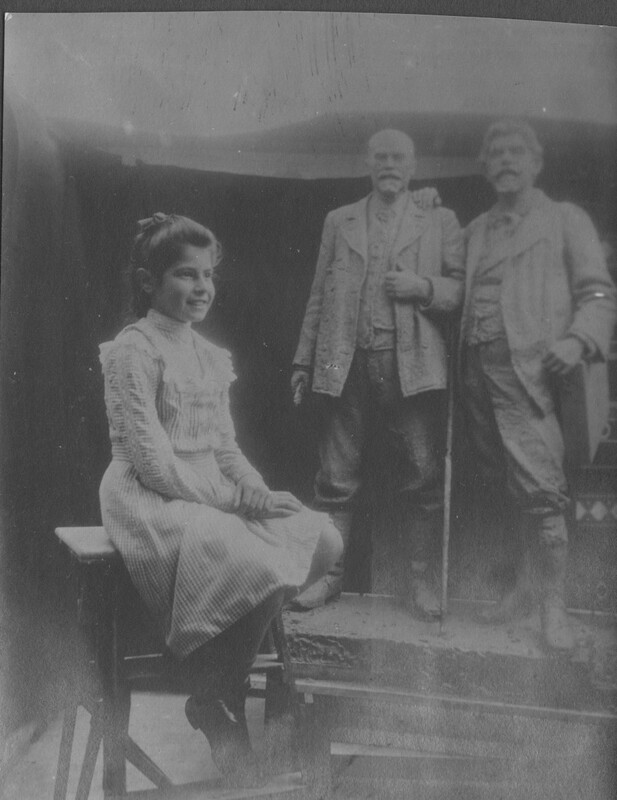 August 1899 dies Ursule Tuxen 36 years old by tuberculosis and 3 days later the 9. august 1899 Ursule and Laurits ´s eldest daughter Paula dies of brain infection caused by measles only 12 years old. In 1900 Ursule´s mother Olympe de Baisieux born van Calster dies of tuberculosis. Their daughter Elsa died 8. september 1896 only 4 years old of tuberculosis. After having lost their mother Ursule and their big sister Paula in august 1899 the 2 daughters Yvonne (1894-1987) and Nina (1898-1982) stayed together with their grandfather Charles de Baisieux (1833-1925) and grandmother Olympe (1838-1900) in the families country house in Rebecq, Belgium until they in 1902 returned permanently to Copenhagen to live with their father Laurits Tuxen and his new wife Frederikke Treschow. Since 1899-1900 Laurits Tuxen moved to Copenhagen, Denmark as his permanent residence. 23. june 1901 Laurits Tuxen married his second wife Frederikke Treschow born 1856, daughter of landowner Michael Treschow (1814-1901), Fritzøehus, Larvik, Norway. Painting by Laurits Tuxen: “Gården på Skagen” dated 26/1-1901, sign. L.T., oil on 5 mm hard millboard. Extract. 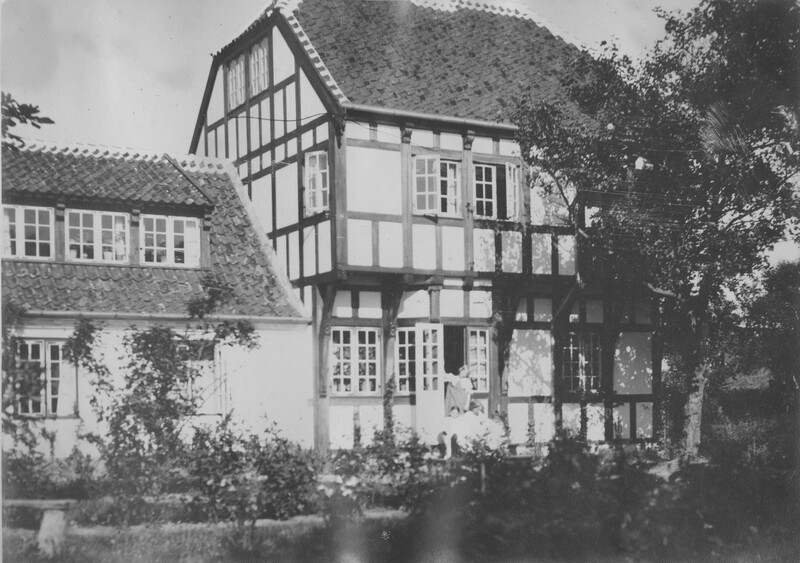 Madam Bendsens Gård i Skagen. Maleri “Gården på Skagen” af Laurits Tuxen dateret 26/1- 1901 sign. L.T. olie på 5 mm tyk hård pap. Udsnit. Privateje. 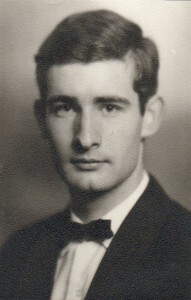 Foto 2008. Copyright 2011 Erik K Abrahamsen, All rights reserved. Now Laurits Tuxen is again back in Skagen since his last visit in october 1876. With his new wife Frederikke they hire danish architect Thorvald Jørgensen (1867-1946) to rebuild and expand “Madam Bendsens Yard” to atelier and summer residence. In summer 1902 “Villa Dagminne” is ready for occupation and Laurits Tuxen´s 2 daughters Yvonne and Nina with his first wife Ursule (1862-99) moves from Rebecq in Belgium to Denmark to be together with their father and stepmother. “Villa Dagminne”, Skaw – photo by Laurits Tuxen. The photo has no data. My guess is: Photo 1903, Frederikke Tuxen sitting on doorstep with Yvonne Tuxen 9 years old at left and Nina Tuxen 5 years old at right and standing Vibeke Krøyer 8 year old. Villa Dagminne, Skagen. Photo by Laurits Tuxen. Photo 1903 is my guess: On doorstep Frederikke Tuxen sitting with Yvonne Tuxen 9 years old at left and Nina Tuxen 5 years old at right and standing Vibeke Krøyer 10 years old. 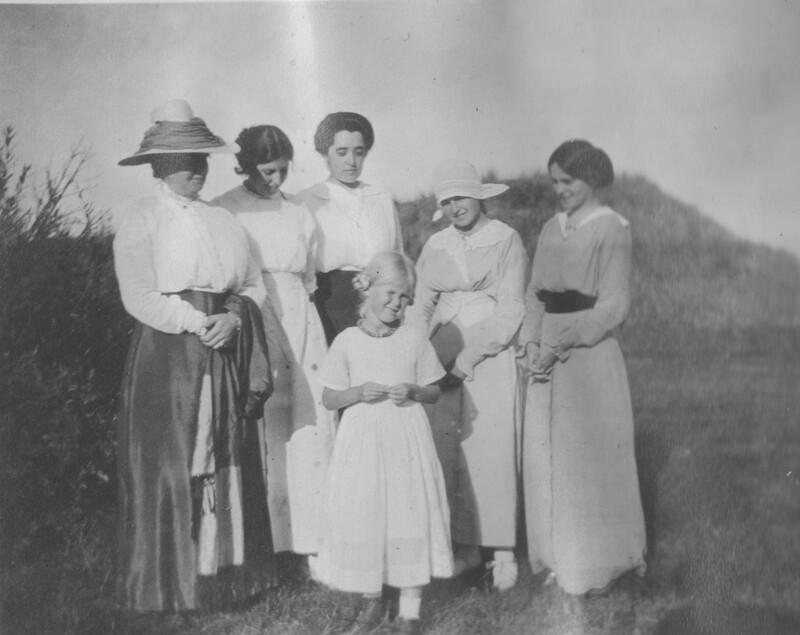 Photo scanned 2. february 2016 from Laurits Tuxen´s private photo album 1902-27. Hunting in suroundings heaths and dunes of Skagen, Denmark. Photo by Laurits Tuxen. 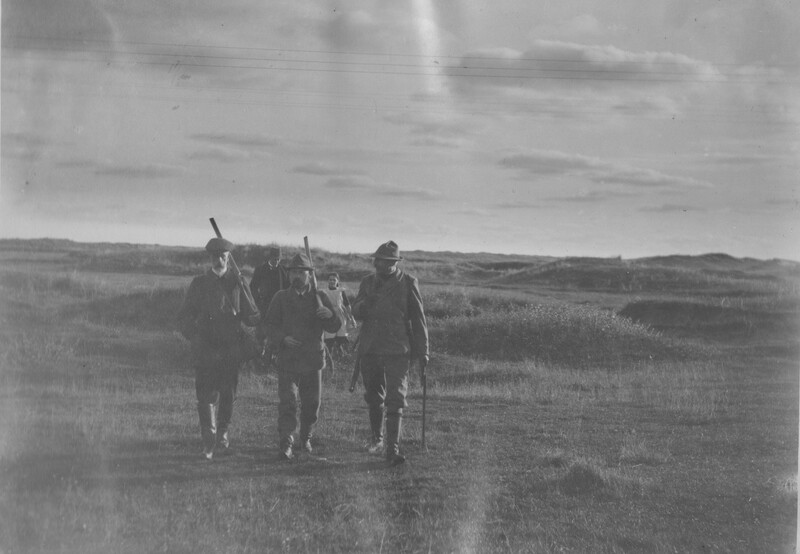 Photo from Laurits Tuxen´s private photo album 1902-27. Photo scanned 2. february 2016. Laurits Tuxen comes home from hunting and meet with friends and families. Villa Dagminne and its surroundings of heaths and dunes, Skagen. Photo from Laurits Tuxen private photo album 1902-27. Scanned january 2016. Hunting at Villa Dagminne and its surroundings in Skagen. Laurits Tuxen meets with his friends and families after hunting. 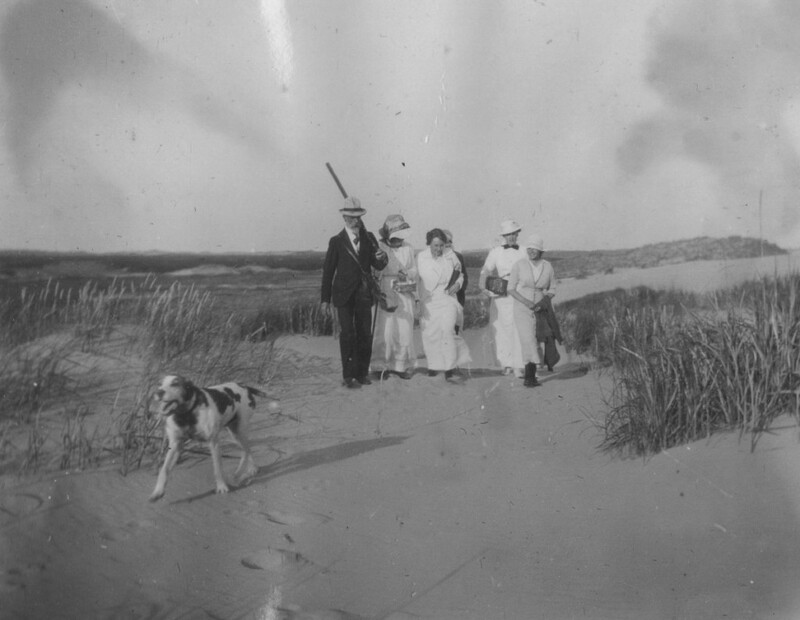 Photo from Laurits Tuxens private photo album 1902-27. Scanned january 2016..
Frederikke Tuxen in summer residence “Villa Dagminne”, Skagen. 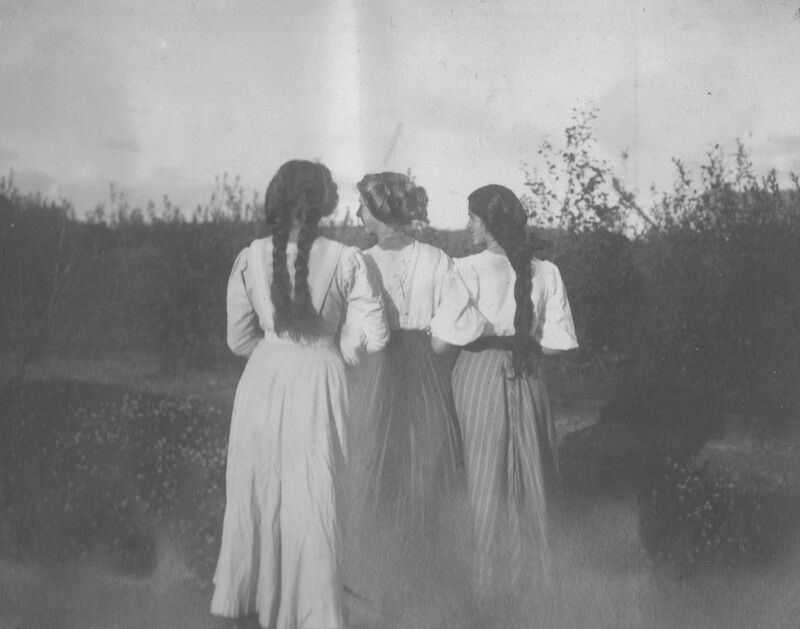 Photo by Laurits Tuxen from his private photo album 1902-27. Photo scanned 2. february 2016. Villla Dagminnne, Skagen. 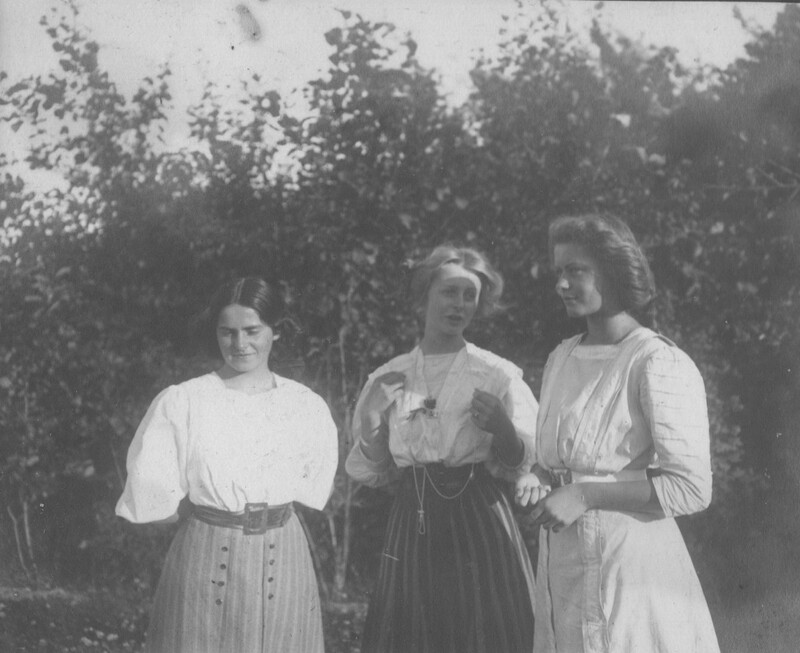 At left Vibeke Krøyer, at right Yvonne Tuxen and in the middle Nina Tuxen. 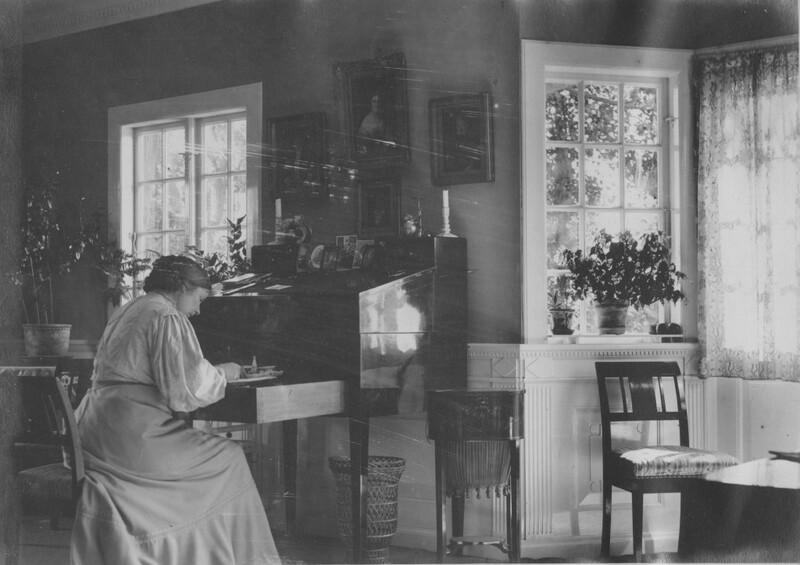 Photo by Laurits Tuxen from his private photo album 1902-27. Scanned january 2016. Villa Dagminnne, Skagen. 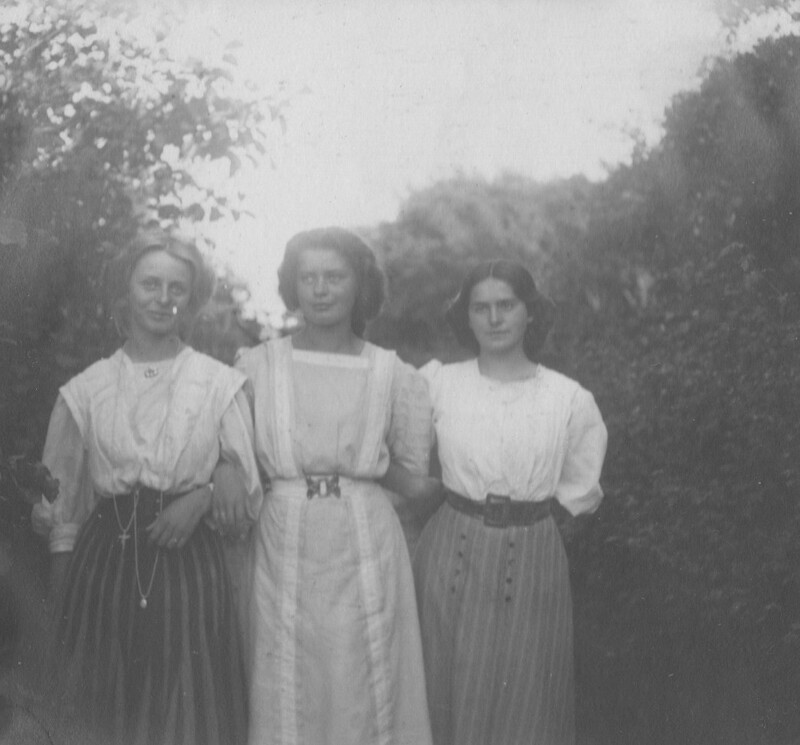 At left Nina Tuxen and at right her older sister Yvonne Tuxen both daughters of Laurits Tuxen with his first wife Ursule de Baisieux. 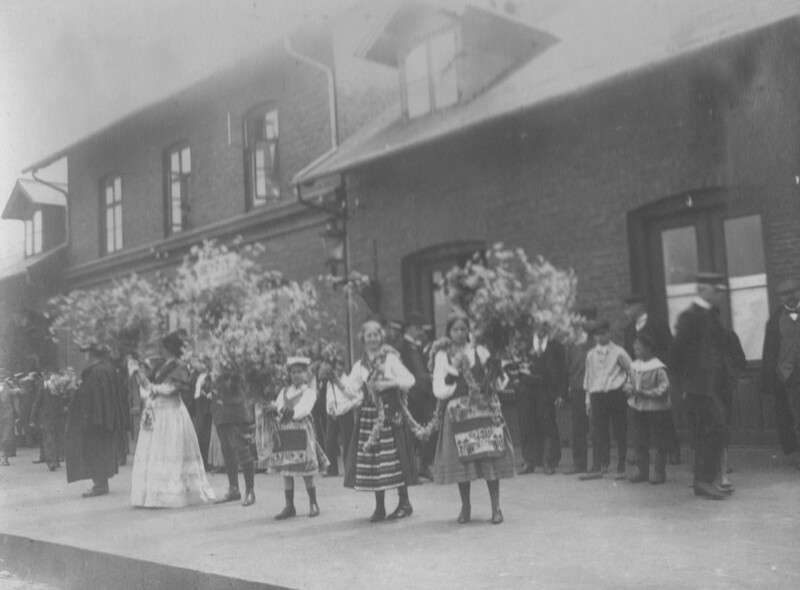 Photo by Laurits Tuxen from his private photo album 1902-27 . Scanned january 2016. 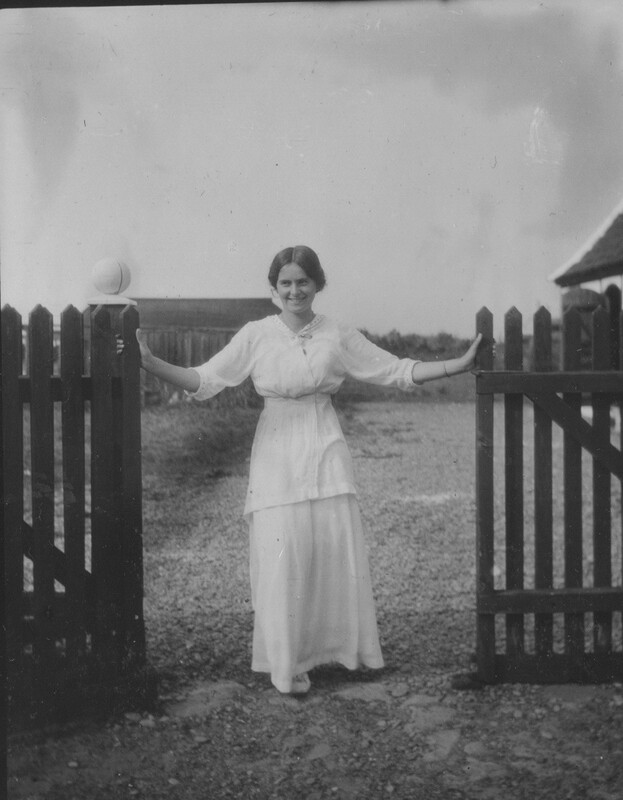 Yonnne Tuxen welcomes at entrance to Villa Dagminne, Skagen. Photo by Laurits Tuxen from private photo album 1902-27. Scanned 2. february 2016. Laurits Tuxen with his dog in garden of Villa Dagminne, Skagen. Photo from Laurits Tuxen private photo album. Scanned 2. february 2016. 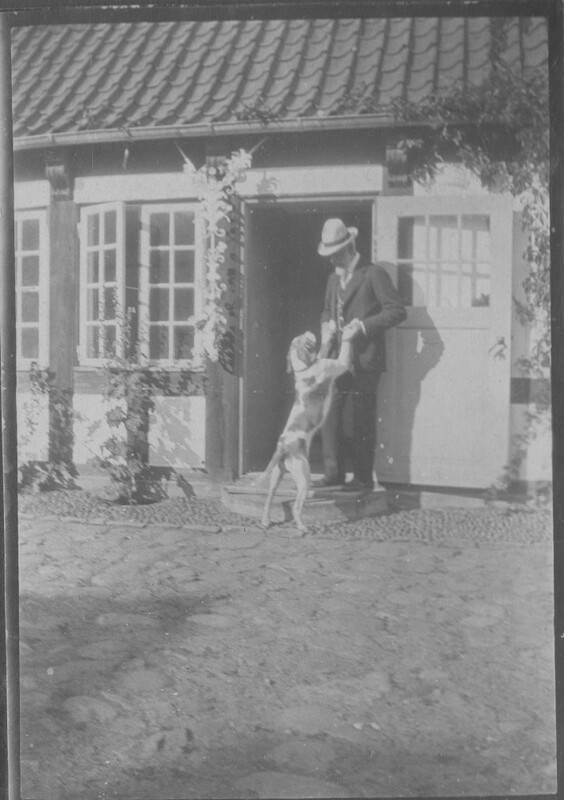 Laurits Tuxen with his dog on courtyard in Villa Dagminne, Skagen. Photo from Laurits Tuxen private photo album 1902-27. Scanned january 2016. 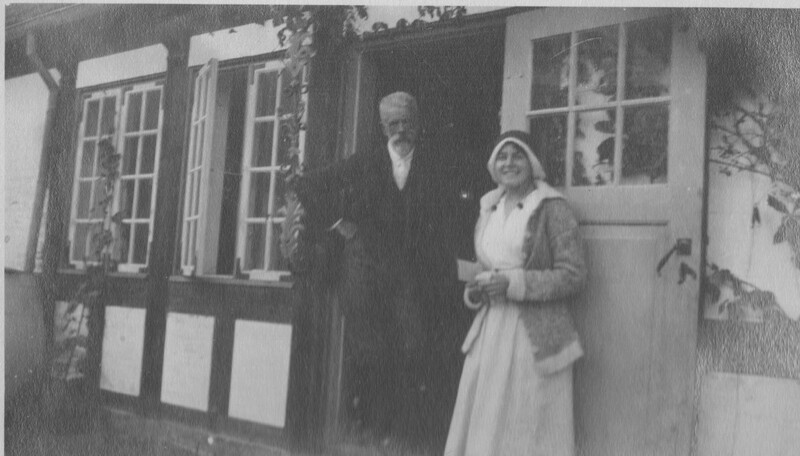 Courtyard “Villa Dagminne”: Tuxen with his daughter Nina. Photo from Laurits Tuxen photo albom 1902-27. Scanned february 2016. Artistic work by Laurits Tuxen in Skagen. Dubblestatue of Michael Ancher and P. S. Krøyer, 248 cm high, 1907-08. 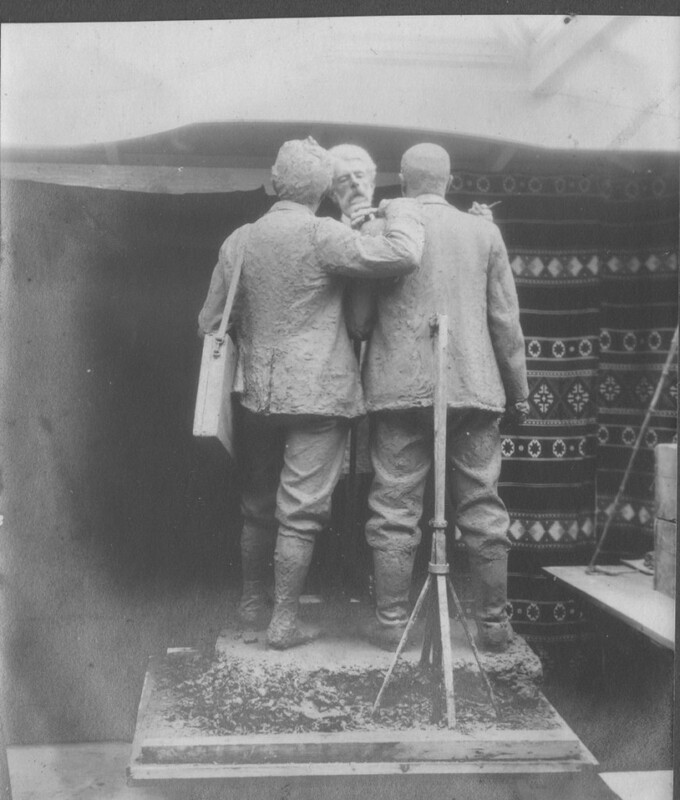 Laurits Tuxen right on photo works with his assistant on dubble statue of Michael Ancher and P. S. Krøyer, 1907-08. Atelier in Villa Dagminne. Photo from Laurits Tuxens private photo album. Scanned january 2016. 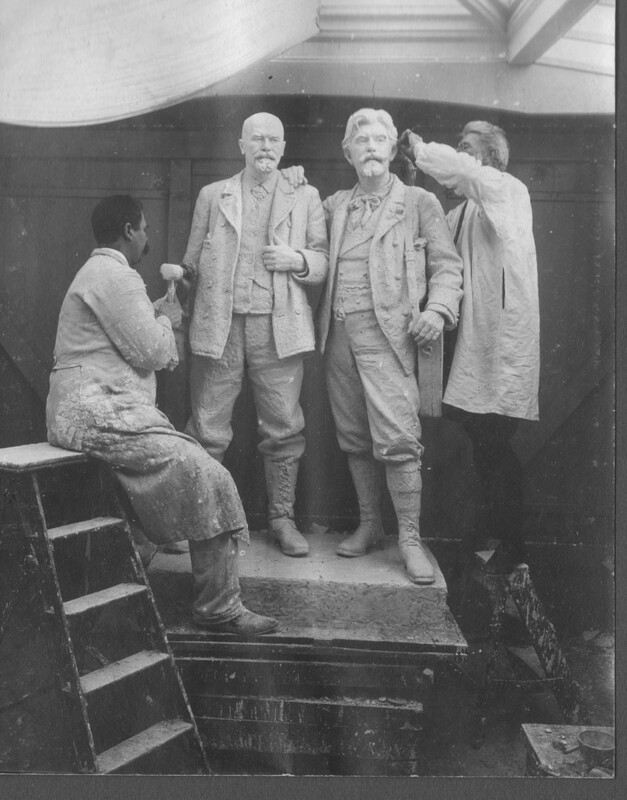 Laurits Tuxen works in his atelier in Villa Dagminne on 248 cm high dubble statue of Michael Ancher and P.S.Krøyer, 1907-08. Photo from Laurits Tuxen private photo album. Scanned 2. february 2016. 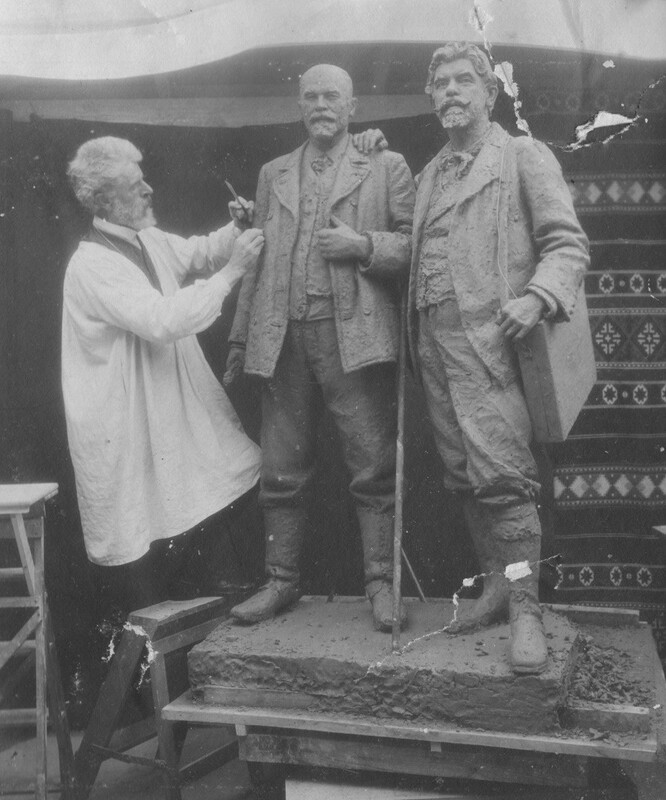 Laurits Tuxen works on dubble statue of Michael Ancher and P. S. Krøyer in his atelier in Villa Dagminne, Skagen, 1907-08. Photo from Laurits Tuxen´s private photo album 1902-27. Scanned 2. january 2016. 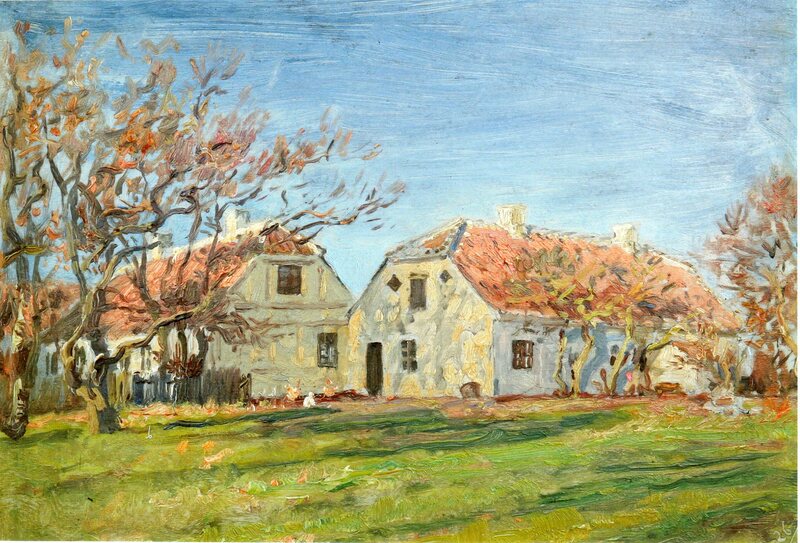 Laurits Tuxen atelier in Villa Dagminne, Skagen. Dubble statue 248 cm high by Laurits Tuxen, 1907-08. Photo from Laurits Tuxen private photo album 1902-27. Scanned 2. febraaur 2016. 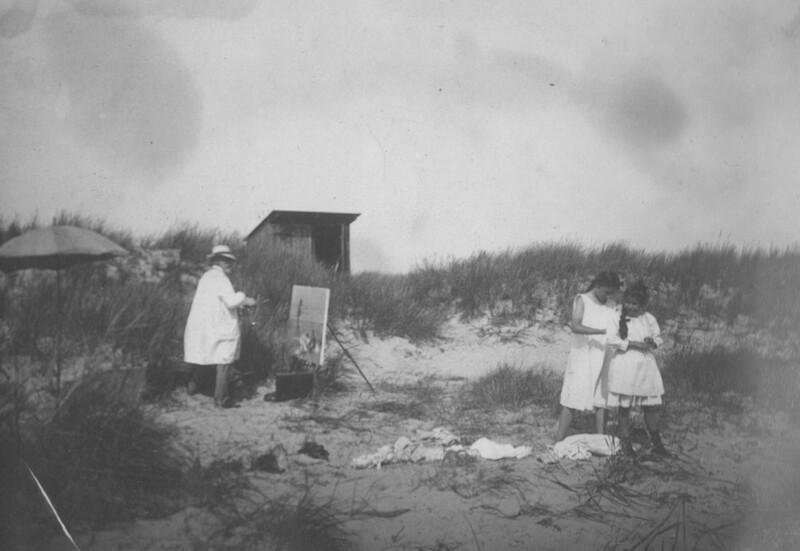 Laurits Tuxen painting outdoor on the beach close to Villa Dagminne, Skagen, 1907. 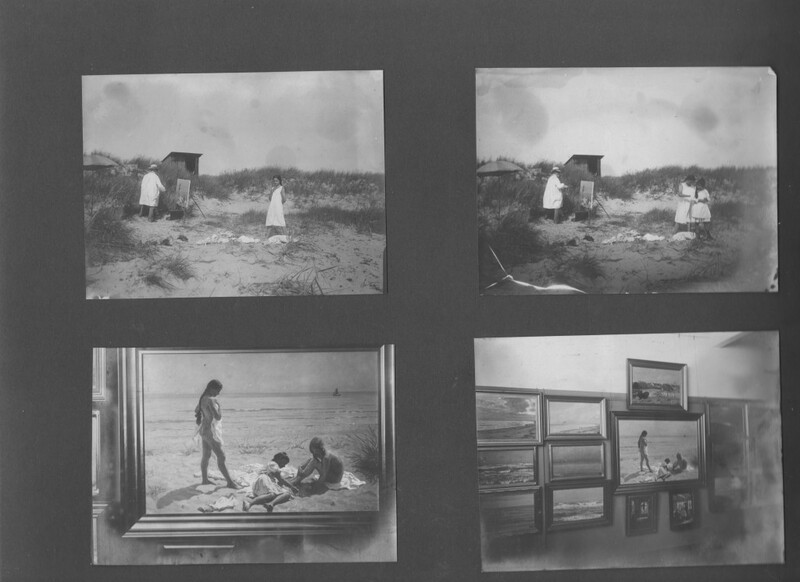 4 photos from Laurits Tuxens private photo album 1902-27. Scanned 2. january 2016. Laurits Tuxen painting on beach close to Villa Dagminne. Model is his eldest daughter Yvonne 13 years old. Photo from Laurits Tuxen private album 1902-27. Scanned 2. february 2016. Moders: Tuxens 2 daughters Yvonne and Nina. 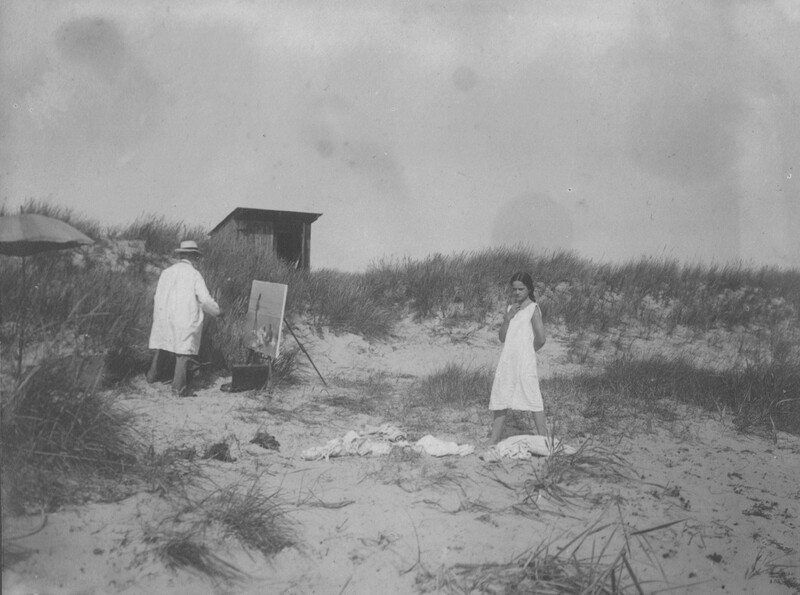 Laurits Tuxen painting on beach close to Villa Dagminne, Skagen, 1907. Models of Tuxens 2 daughters: Yvonne at left and Nina at right. Photo from Laurits Tuxen private photo album 1902-27. Scanned 2. february 2016. 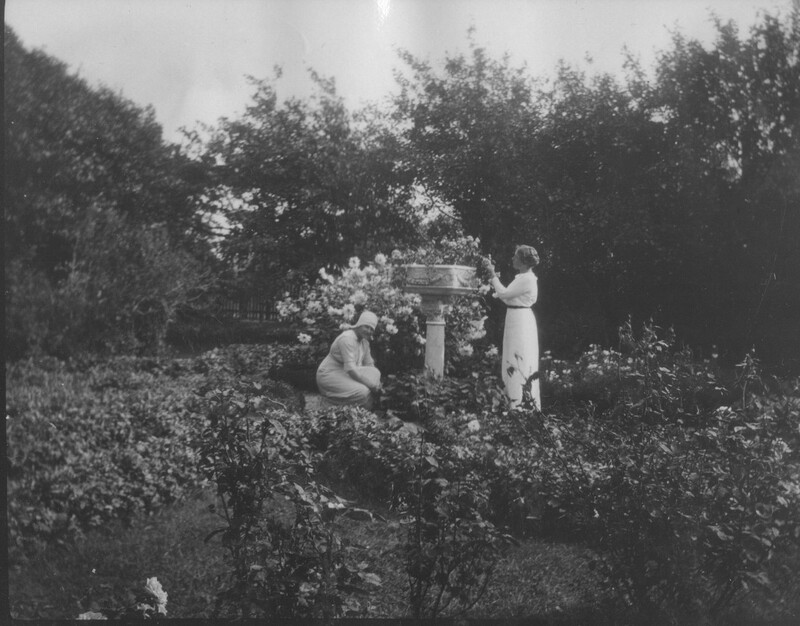 Figurer: Yvonne Tuxen, Nina Tuxen and Vibeke Krøyer. Laurits Tuxen: “Sommerdag på Skagen Strand med Figurer”, 1907, Sign L.T. oil on canvas, 80 x 118 cm. Photo from Laurits Tuxen private photo album 1902-27. Scanned 2. february 2016. Laurits Tuxen: “Sommerdag på Skagen Strand med Figurer”. Sign. L.T. 1907. Olie på lærred. 80 x 118 cm. Source: Catalogue “FINE ART + ANTIQUES”, International auction 854, Auction 24 February – 5 Marts 2015, Bruun Rasmussen Auctioneers of Fine Art, Copenhagen, Denmark. Foto taken inBruun Rasmussens Kunstauktioner, København the 23. februar 2015 by Erik K Abrahamsen. Copyright 2015 Erik K Abrahamsen. All rights reserved. The above painting Laurits Tuxen: “Sommerdag på Skagen Strand med Figurer”. Sign. L.T. 1907. Olie på lærred. 80 x 118 cm was sold 24. Februar 2015 on Bruun Rasmussens Auctioneers of Fine Art, Copenhagen to the price 1,8 mill. danish crowns – the highest price for a painting by Laurits Tuxen. 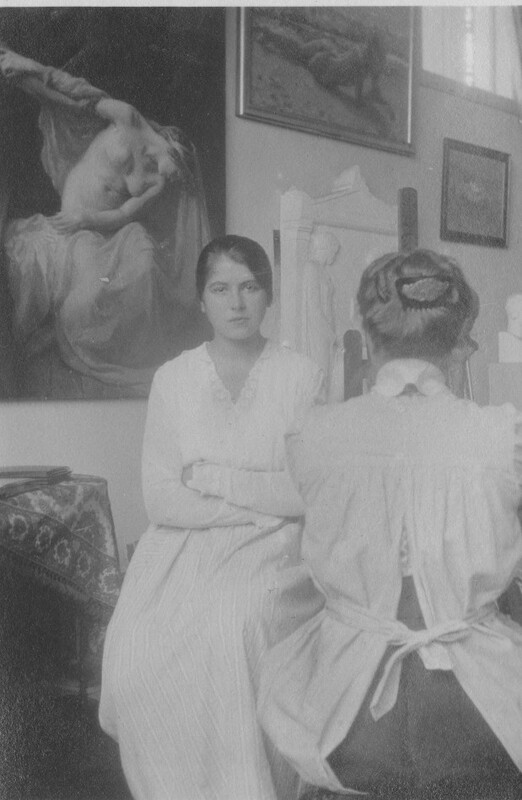 Nina Tuxen in Laurits Tuxens atelier in Villa Dagminne, Skagen. Photo from Laurits Tuxen private album 1902-27. Scanned january 2016. Laurits Tuxen : Preliminary study to final painting: “Yvonne Tuxen og Vibekae Krøyer”, 19o9, Olie på lærred, 119 x 156 cm. Photo from Laurits Tuxen private photo album 1902-27. Scanned january 2016. Villa Dagminne. 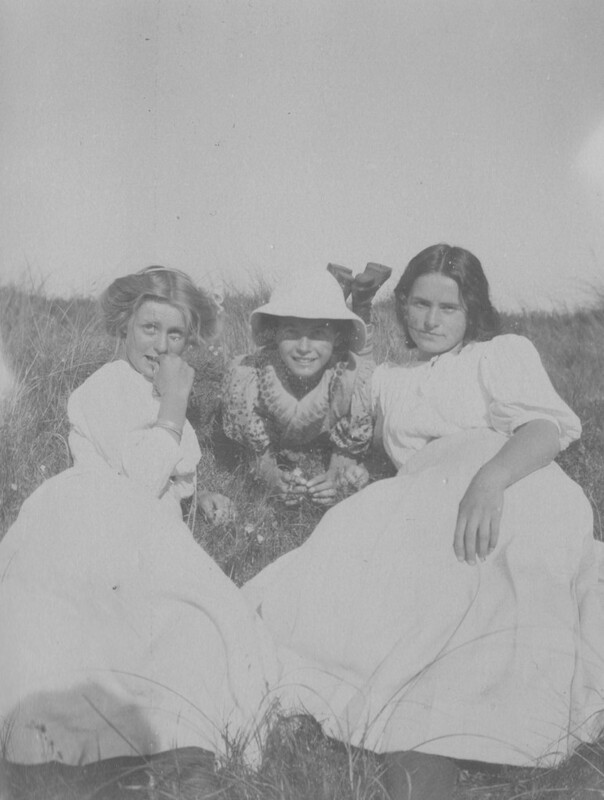 At left Yvonne Tuxen and at in middle Vibeke Krøyer.Photo by Laurits Tuxen. Photo from Laurits Tuxen private photo album 1902-27. Scanned 2. february 2016. Villa Dagminne, Skagen. Yvonne Tuxen at right and Vibeke Krøyer in middle. Photo by Laurits Tuxen. 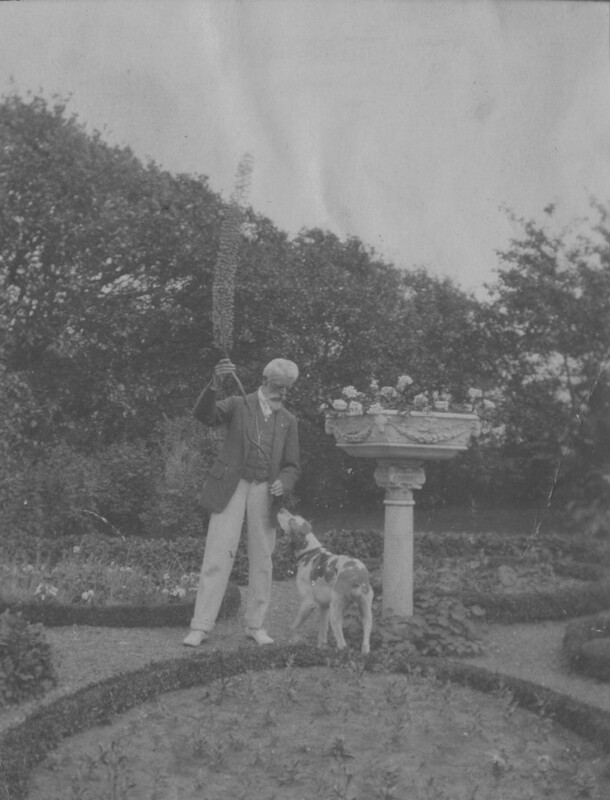 Photo from Laurits private album 1902-27. Scanned 2. february 2016. Villa Dagminne, Skagen. At left Vibeke Krøyer and at right Yvonne Tuxen. Photo by Laurits Tuxen. Photo from Laurits Tuxen private photo album 1902-27. Scanned 2. february 2016. 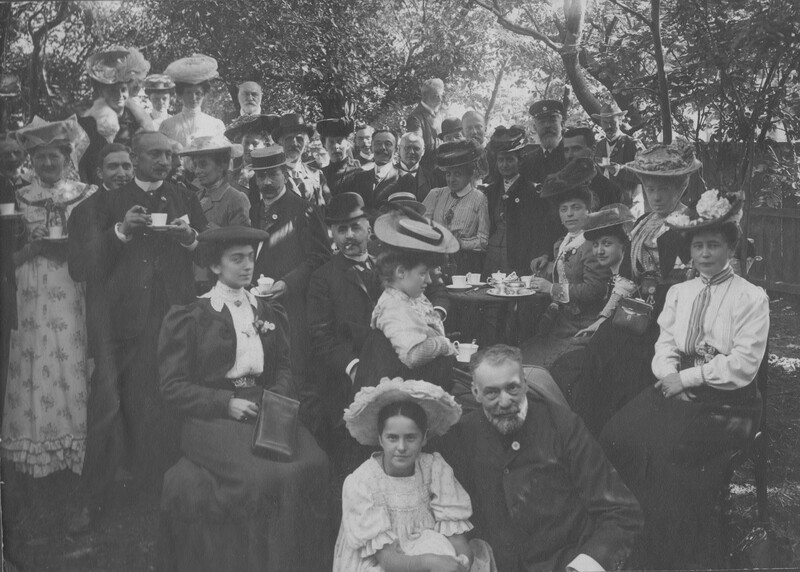 Friends and family of Frederikke and Laurits Tuxen at “Villa Dagminne”, Skagen. 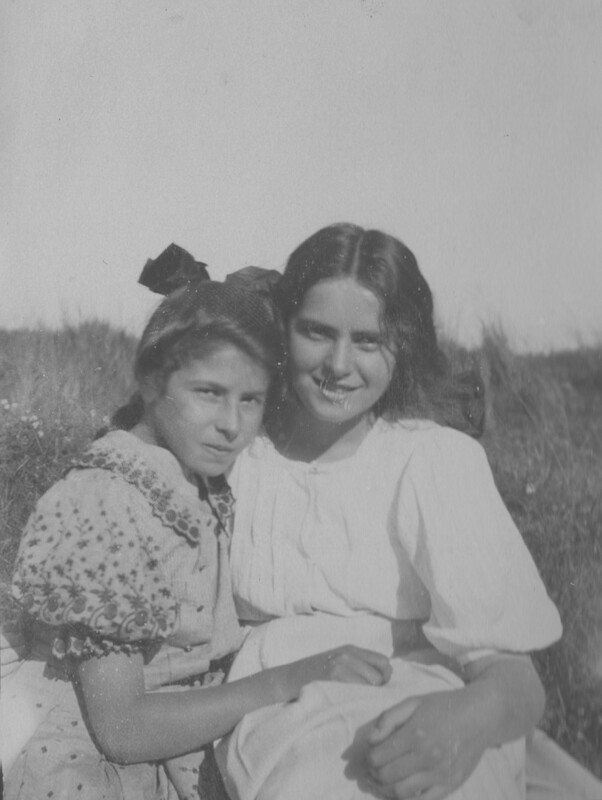 From right to left on photo Yvonne Tuxen (1894-1987) and Nina Tuxen (1898-1982). Photo by Laurits Tuxen. Photo from Laurits Tuxen private photo album. Scanned february 2016. Villa Dagminne Garden, Skagen. At left on photo Nina Tuxen. Photo by Laurits Tuxen. Photo from Laurits Tuxen private photo album. Scanned january 2016. Villa Dagminne, Skagen. Photo by Laurits Tuxen. Photo from Laurits Tuxen private photo album. Scanned january 2016. At left Frederikke Tuxen and at right Laurits Tuxen. “Villa Dagminne”, Skagen. 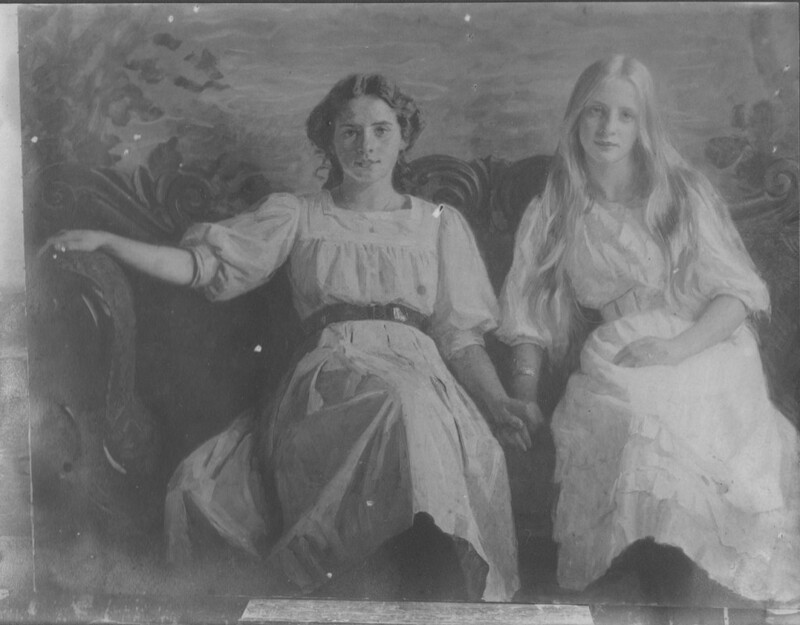 At left Frederikke Tuxen and at right Laurits Tuxen. Photo about 1915. Photo from Laurits Tuxen private photo album 1902-27. Scanned january 2016. Garden Party in Villa Dagminne, Skagen. In front of photo Yvonne Tuxen and in the background Laurits Tuxen. Photo about 1908. Photo from Laurits Tuxen private photo album 1902-27. Scanned january 2016. Weicome to guests on Skagen Railway Station. Photo by Laurits Tuxen. Photo from Laurits Tuxen private photo album 1902-27. Scanned january 2016. 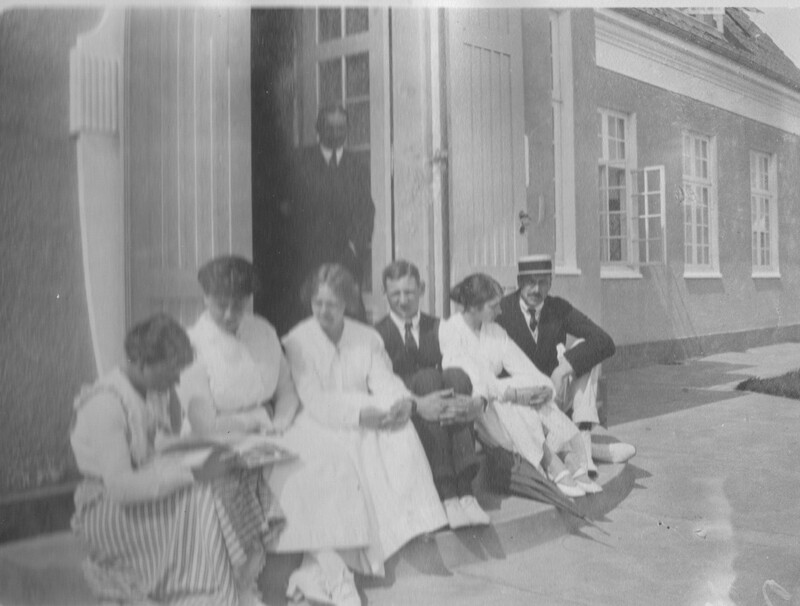 The Royal Danish family in front of Summer Residence “Klitgaarden”, Skagen. At right King Christian 10 (1870-47) and in the middle his son Crown Prince Frederik (1899-1972). Photo by Laurits Tuxen. Photo from Laurits Tuxen private photo album 1902-27. Scanned february 2016. The Royal Danish Familie at Kattegat Sea near their royal summer residence “Klitgaarden”, Skagen . Phot by Lasurits Tusen. Fotos from Laurits Tuxen private photo album. Scanned february 2016. Royal Danish Family with friends recreating in dunes at Kattegat Sea and close to royal summer residence “Klitgaarden”, Skagen. Photo by Laurits Tuxen. Photo from Laurits Tuxen private photo album 1902-27. Scanned february 2016. 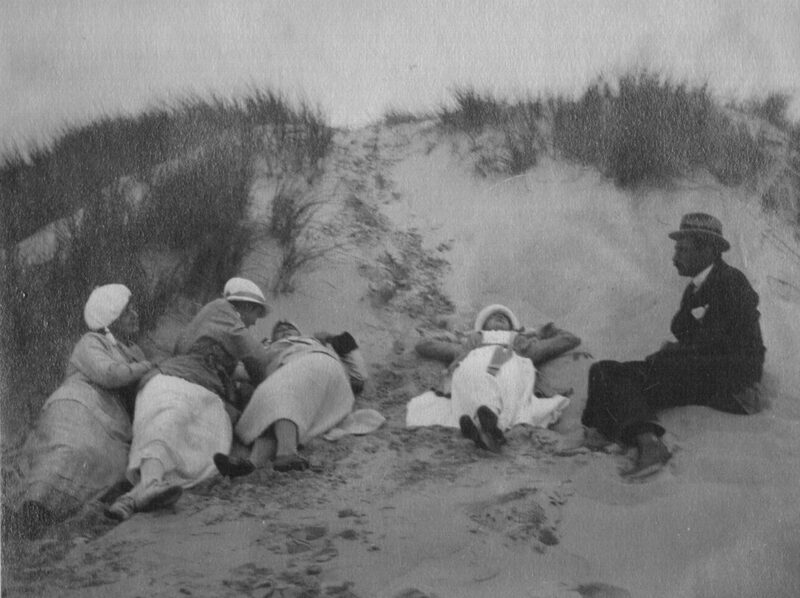 The Royal family relaxing in dunes close to Klitgaarden, Skagen. At right King Christian 10 of Denmark (1912-47), 1870-1947. Photo Laurits Tuxen ca 1915 from his private photo album 1902-27. The Royal Danish Family with friends swimming in Kattegat Sea. 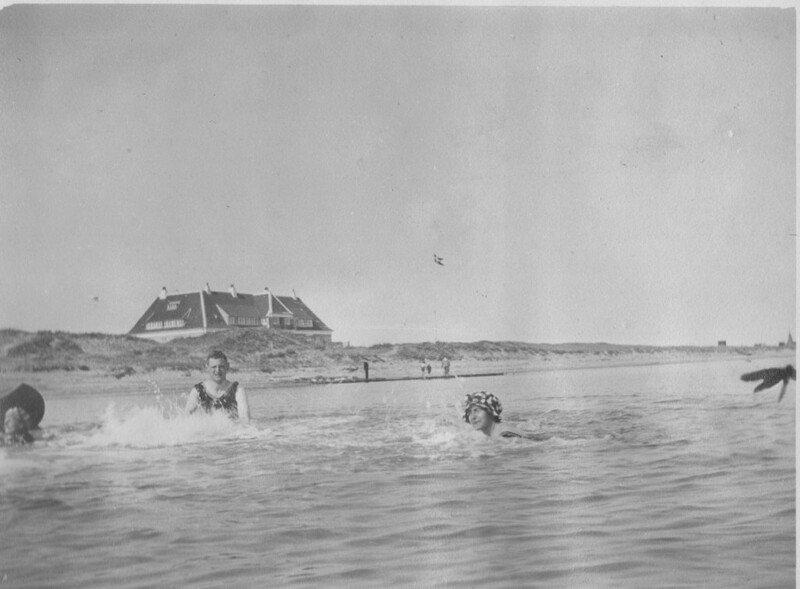 In background on photo you can see the royal families summer residence “Klitgaarden”, Skagen. In the middle of photo Crown Prince Frederik (1899-1972), King of Denmark 1947-72.Photo by Laurits Tuxen. Photo from Laurits Tuxen private photo alum. Scanned february 2016. 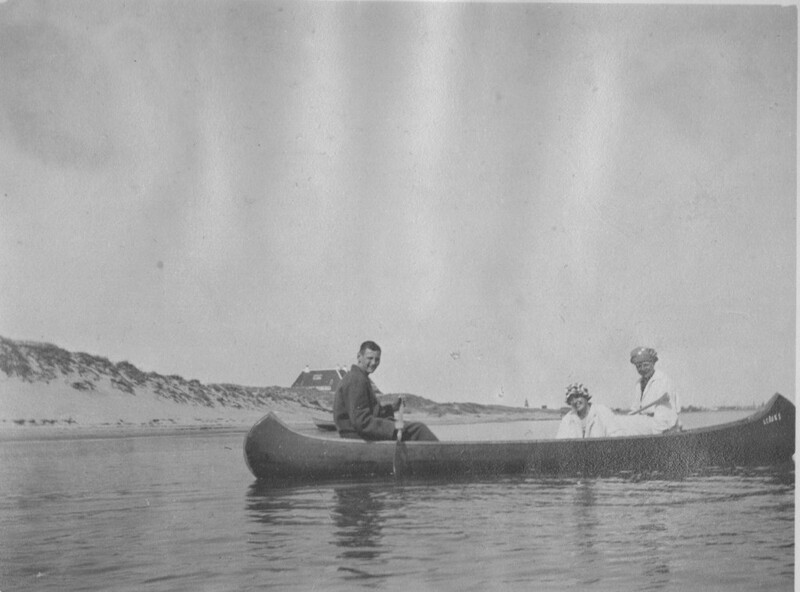 The Royal Famile and friends in a canoe at Kattegat Coast with royal summer residens “Klitgaarden” in the background. At left Crown Price Frederik born 1899. Photo by Laurits Tuxen. Photo from Laurits Tuxen private photo album 1902-27. Scanned february 2016. Royal Danish Family with friends in canoes on Kattegat Sea close to royal summer residence “Klitgaarden”, Skagen. At right on photo Danish King Christian 10 (1870-1947), King of Denmark 1912-47. Phoot by Laurits Tuxen. Photo from Laurits Tuxen private photo album 1902-27. Scanned february 2016. 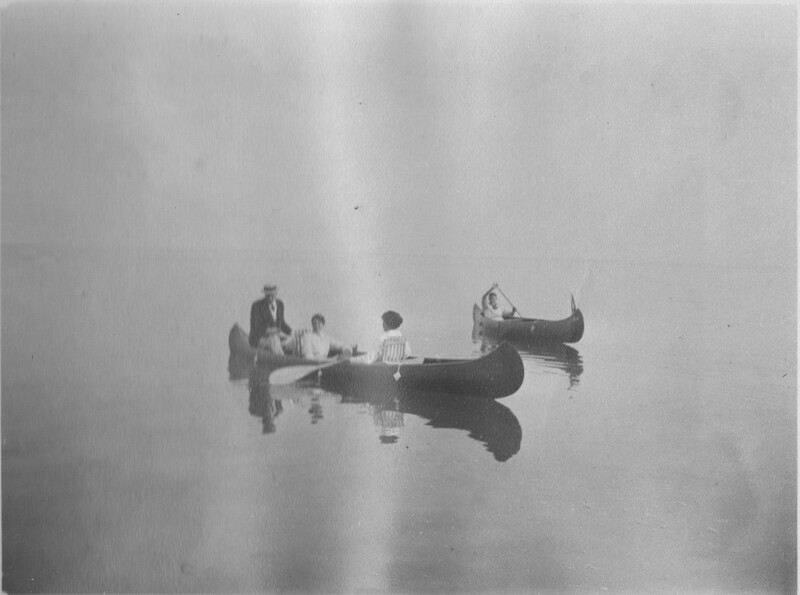 Royal Danish Family with friends in canoe on Kattegat Sea close to royal summer residence “Klitgaarden” at the coast of Kattegat. In the canoe Crown Prince Frederik born 1899. Photo by Laurits Tuxen. 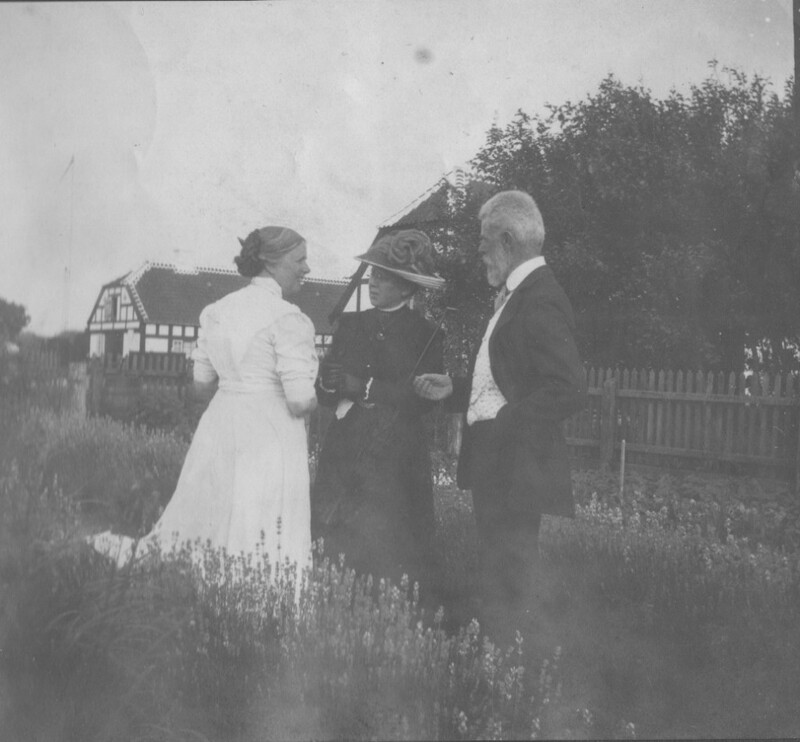 Photo from Laurits Tuxen private photo album 1902-27. Scanned february 2016. Royal Danish Family with friends on bikes in Skagen, Denmark. 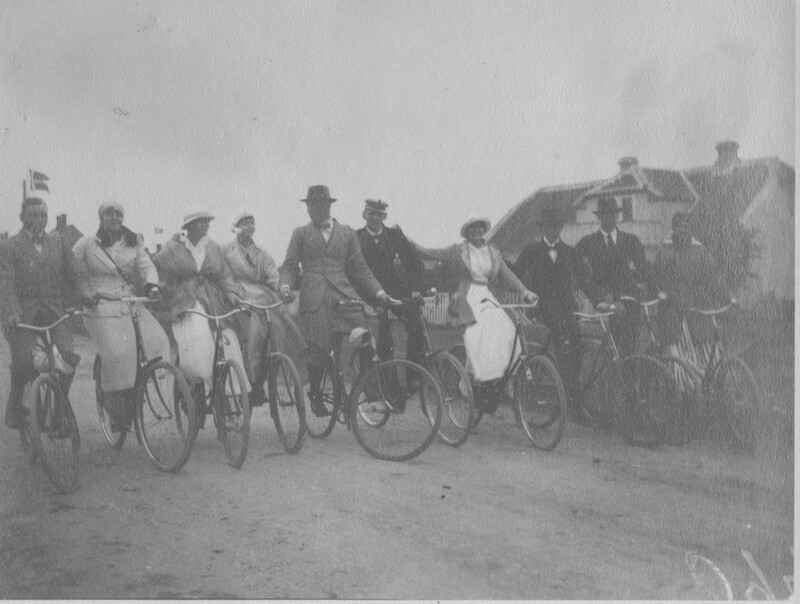 In middle of photo (number 5 from right) is Crown Prince Frederik born 1899 on bike with a white peaked cap on his head. Photo by Laurits Tuxen. Photo from Laurits Tuxen private photo album 1902-27. Scanned february 2016. 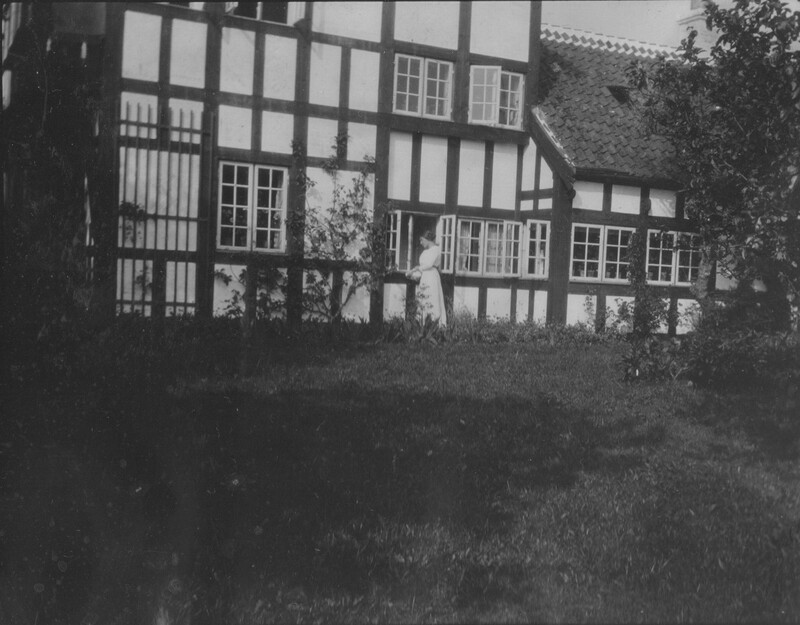 Villa Dagminne, Skagen summer 1916. Yvonne Tuxen (1894-1987) married Flemming G. Voss Wulff (1890-1955) in 1915. 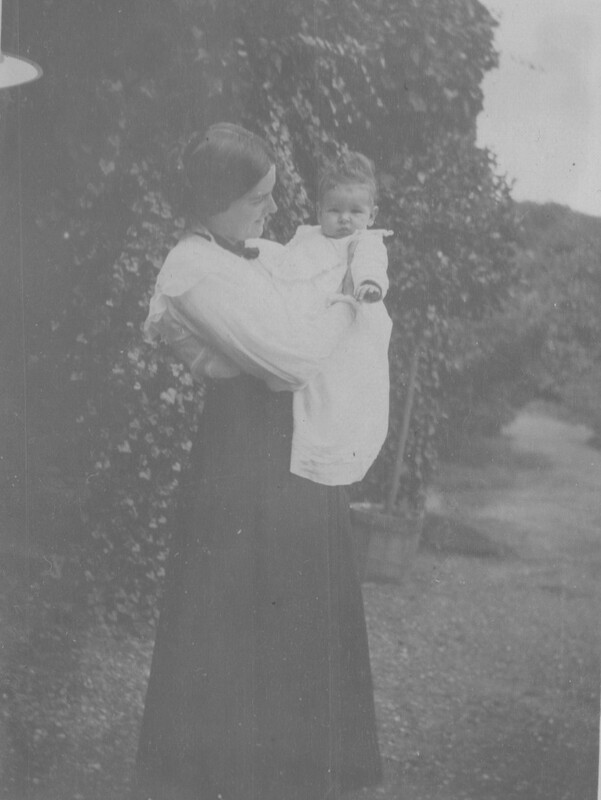 Yvonne Tuxen with her firstborn child – a daughter Birthe Ursula born 3. march 1916. Photo by Laurits Tuxen summer 1916. Photo from Laurits Tuxen private photo album 1902-27. Scanned january 2016. 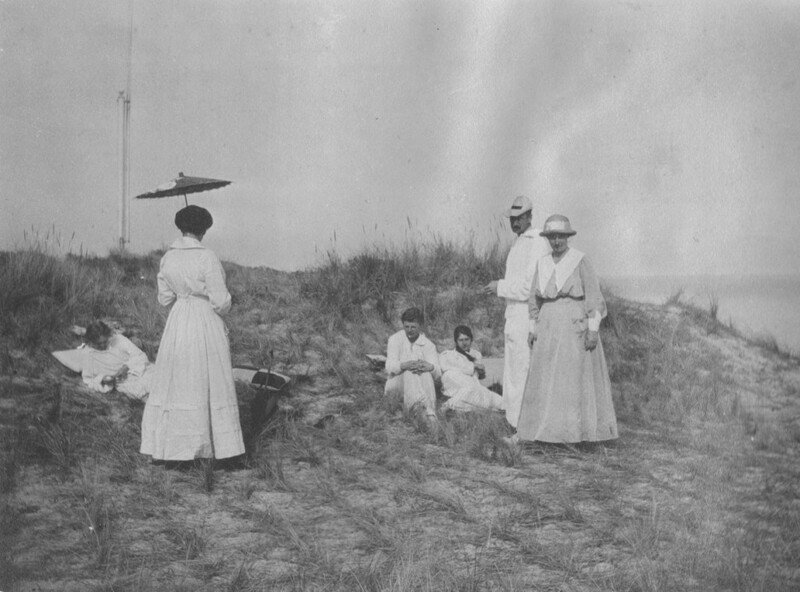 Birthe Ursula and Frederikke Tuxen on beach “Skagen Sønderstrand” at Kattegat Sea. Painted by Laurits Tuxen, 38 x 24 cm, Oil on wood, 1917. Extract. Privateje. 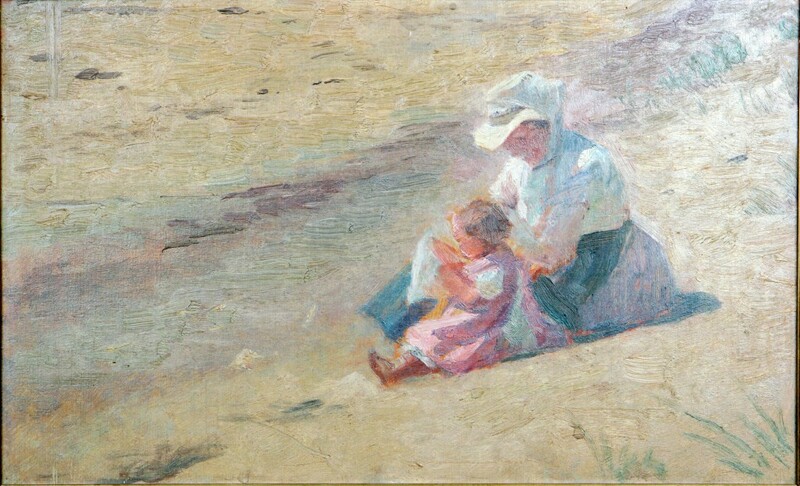 Birthe Ursula (1916-2000) and Frederikke Tuxen (1856-1946) on Skagen Sønderstrand. Painted by Laurits Tuxen, 38 x 24 cm, Oil on wood, 1917. Extract. Photo: 2008. Private. Copyright Erik K Abrahamsen 2011. All rights reserved. Birthe Ursula Wulff. Painted june 1917 in Skagen by Laurits Tuxen. Oil on canvas and wood, 27 x 24 cm. Photo: 2008. Private. Birthe Ursula Wulff. Painted june 1917 in Skagen by Laurits Tuxen. Oil on canvas and wood, 27 x 24 cm. Photo: 2008. Private. Copyright Erik K Abrahamsen 2011. All rights reserved. Hansen & Weller: Laurits and Ursule de Baisieux, Engagement photo, 1885. Private. Hansen & Weller: Laurits Yuxen og Ursule de Baisieux Forlovelsesbillede, 1885. Privateje. Photo 6. may 2016 by Erik K Abrahamsen. 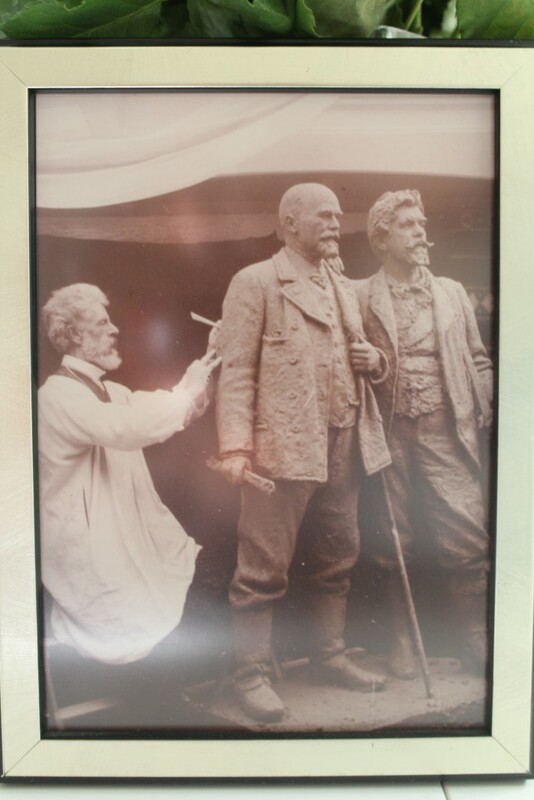 Laurits Tuxen working on doubble statue of Michael Ancher and P. S. Kryøer. 1908. Unknown photographer. Photo of original photo may 2016 by Erik K Abrahamsen. Laurits Tuxen. Danish painter and sculptor 1853-1927. Photo: Fred. Riise. Private. Erik Kristian Abrahamsen born 4. august 1945 in Skagen under my parents Birthe Ursula (1916-2000) and Poul Kristian Abrahamsen (1903-62) summerholiday in Dagminne, Skagen visiting Frederikke Tuxen (1856-1946). Laurits and Ursule Tuxen are my great-grandparents through my grandmother Yvonne Tuxen (1894-1987). Skagen Sygehus. 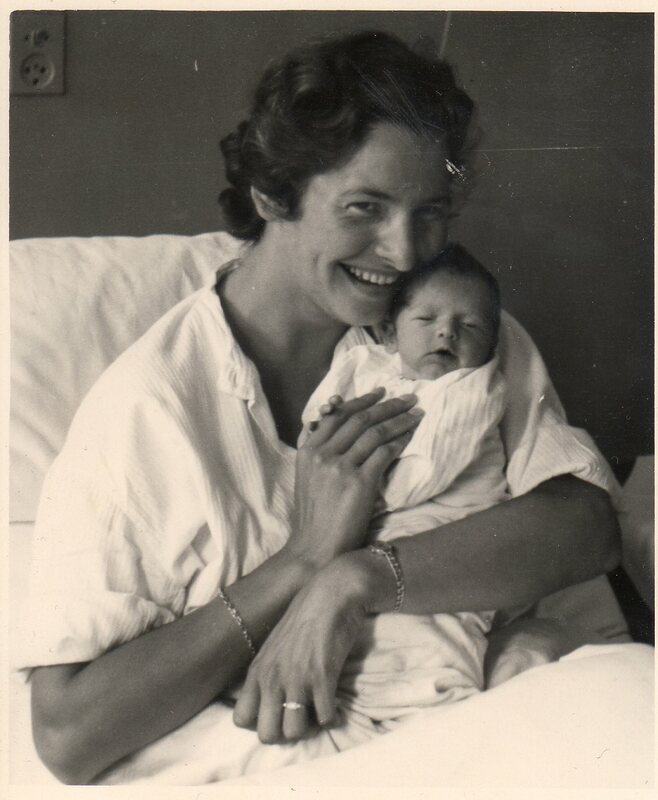 On the above photo I am 4 days old together with my mother Birthe Ursula born 3. march 1916. Photo: 8. august 1945. Photo 6. december 1966 by WEEG. 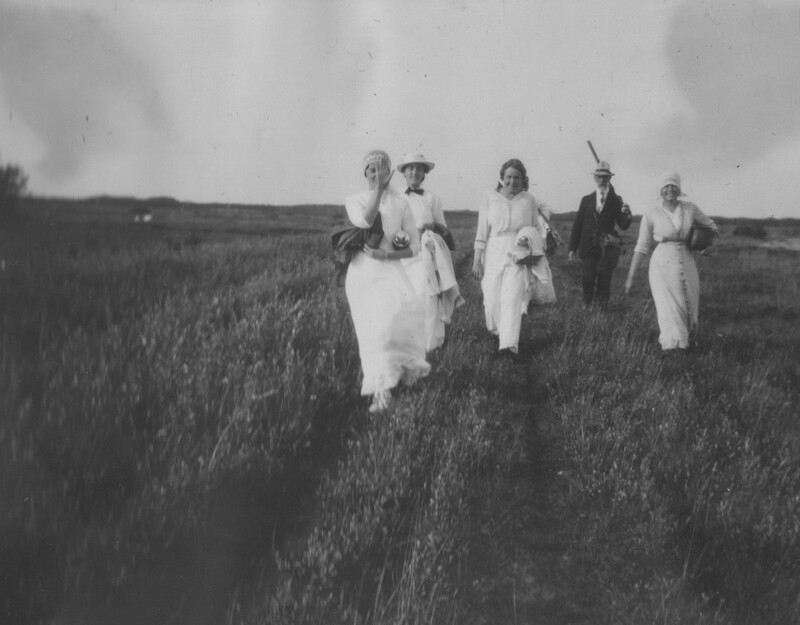 Jeg har med interesse set de på de forskellige fotos af Lauritz Tuxens børn Nina og Yvonne, og det er fotos som jeg ikke har set før og som har vagt min interesse. 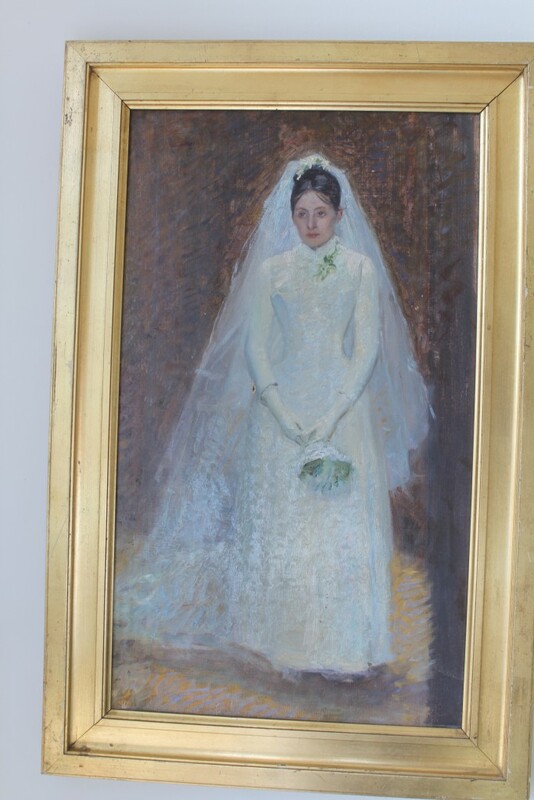 Interessen for Lauritz Tuxen stammer fra Skagen hvor vi er kommet på museet flere gange om året i ca. 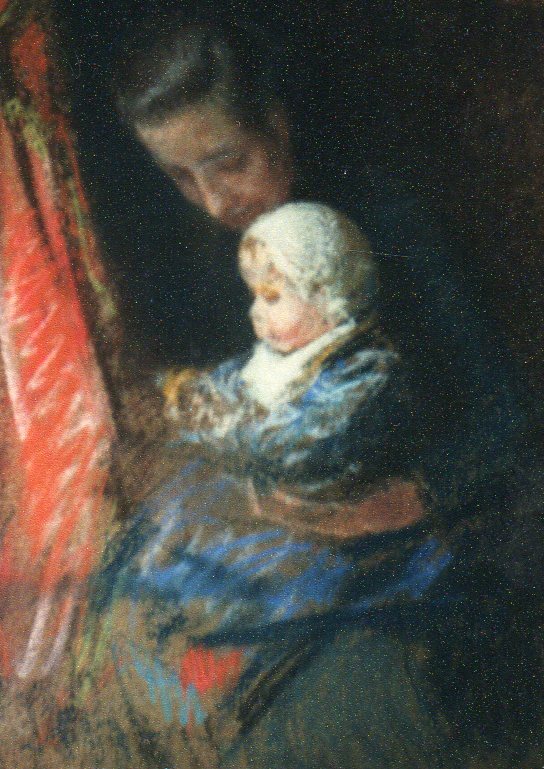 16 år, og på et tidspunkt købt et billede, en pastel, hvor sælgeren sagde at det var en skagens maler, muligvis Lauritz Tuxen, og muligvis Lauritz Tuxens døtre, og jeg har studeret alle de fotos og billeder som jeg har kunne finde meget grundigt for at se om det kunne være dem, og jeg mener at det godt kan være disse piger, bl.a. 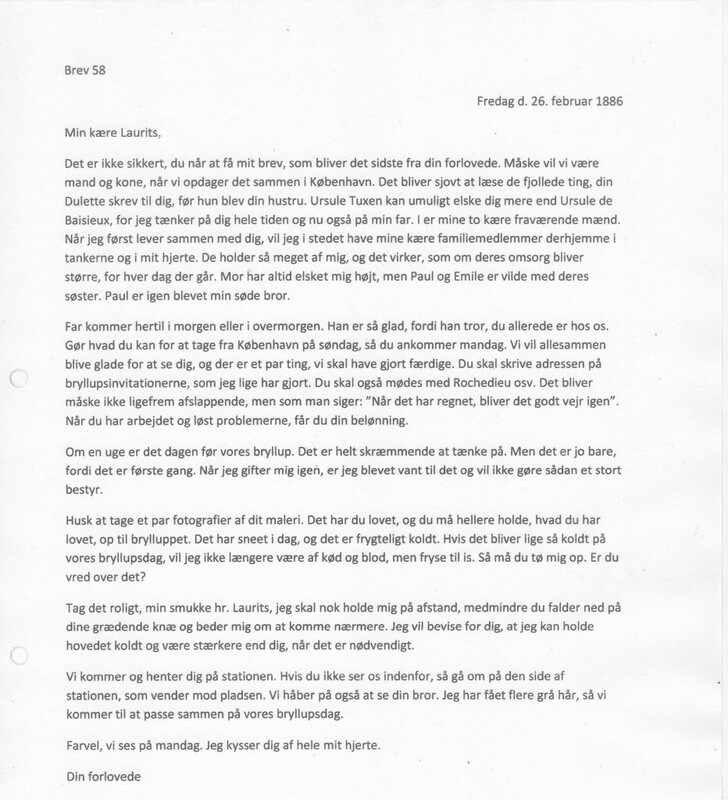 ved at studere hår grænserne hvor Yvonnes er helt lige, men Ninas går lidt ned i en spids. Tusind tak for din beretning og din forespørgsel. Jeg vil meget gerne modtage et billede af omtalte pastel og vil efter bedste evne sende dig min vurdering. Send venligst foto til min mobil 26 79 75 84.